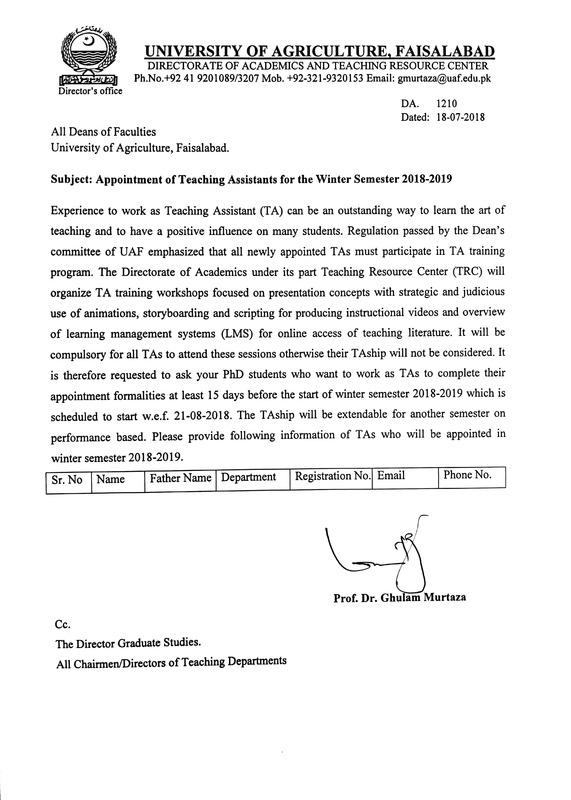 Official email address available for faculty and staff of main and sub-campuses. 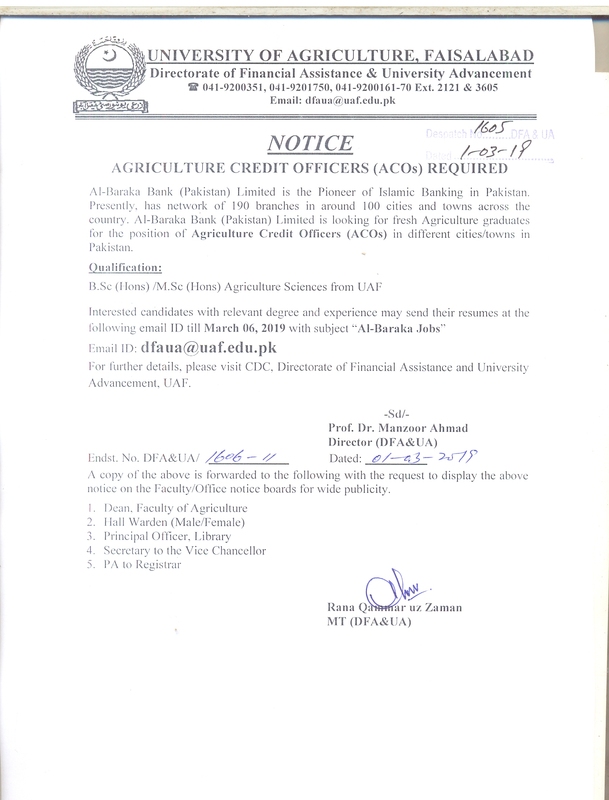 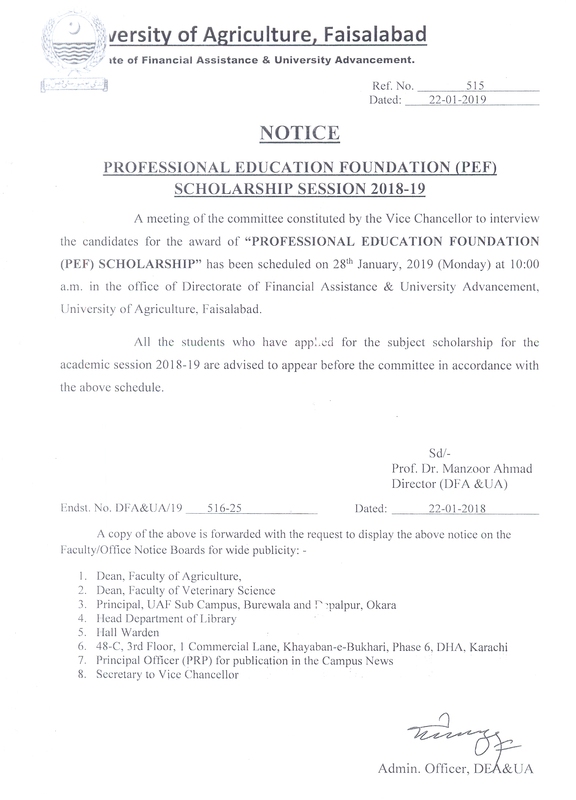 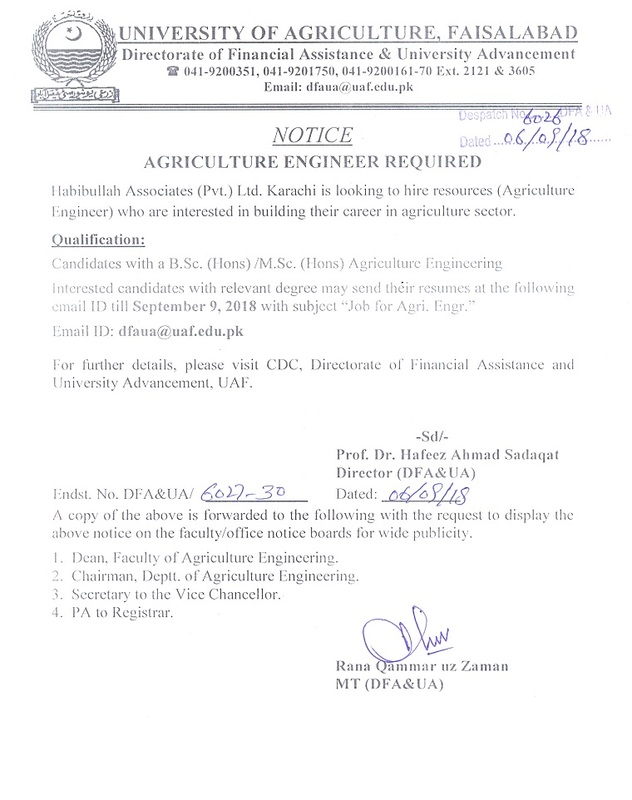 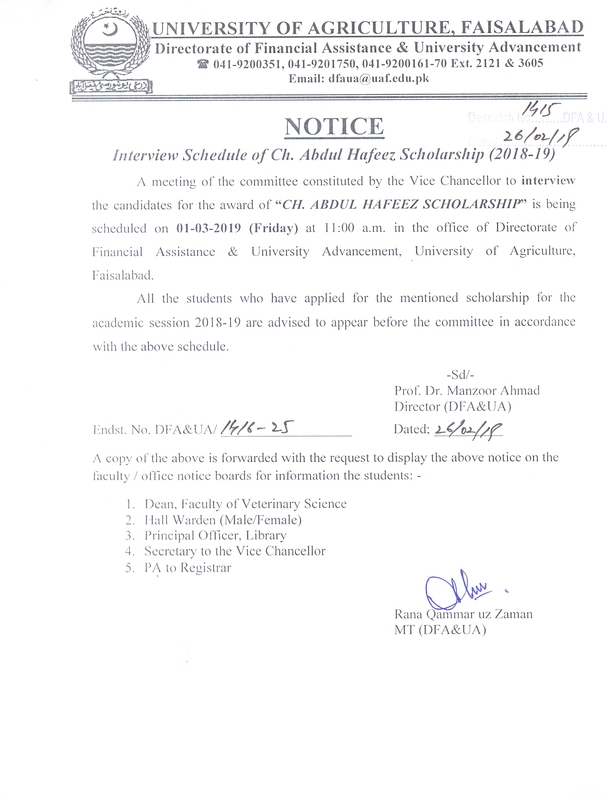 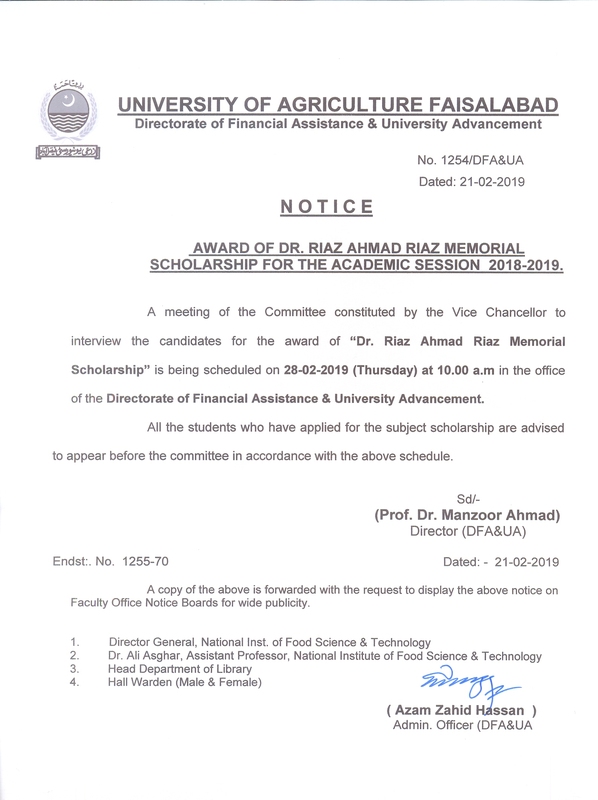 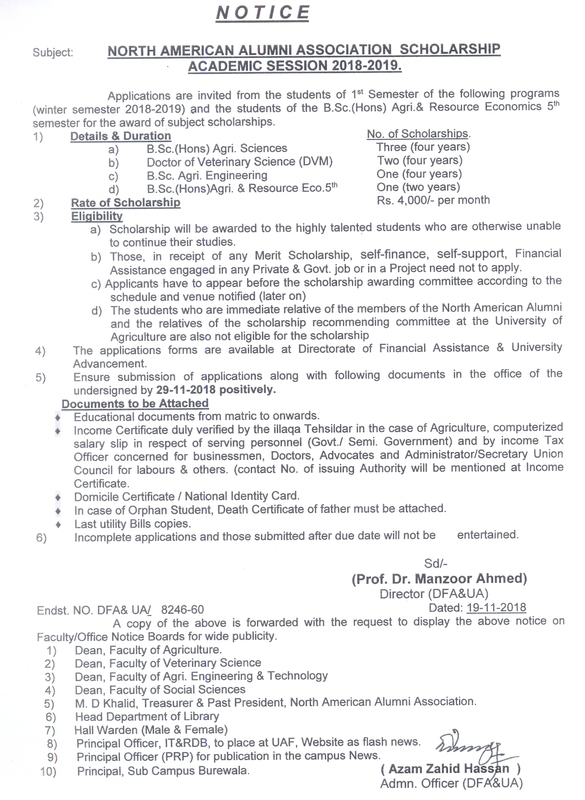 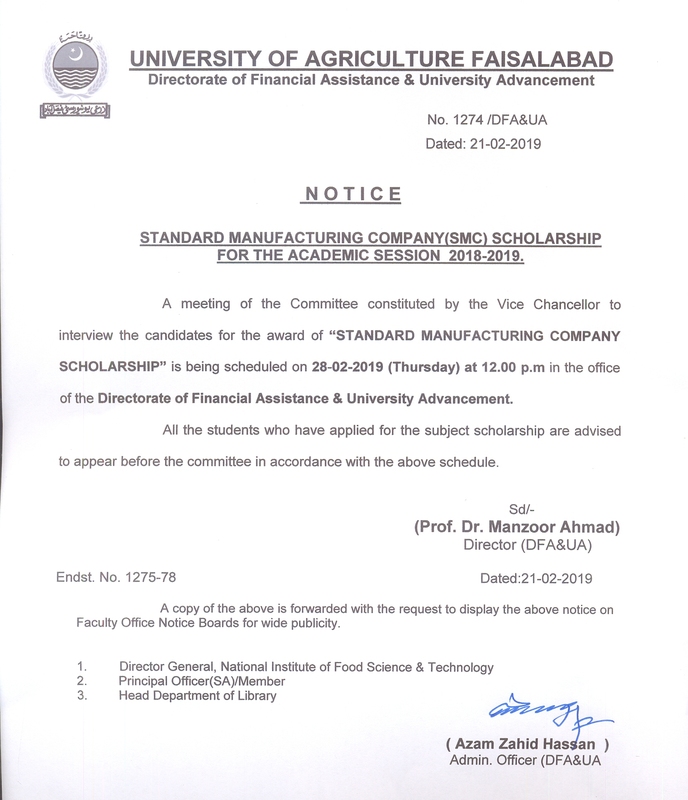 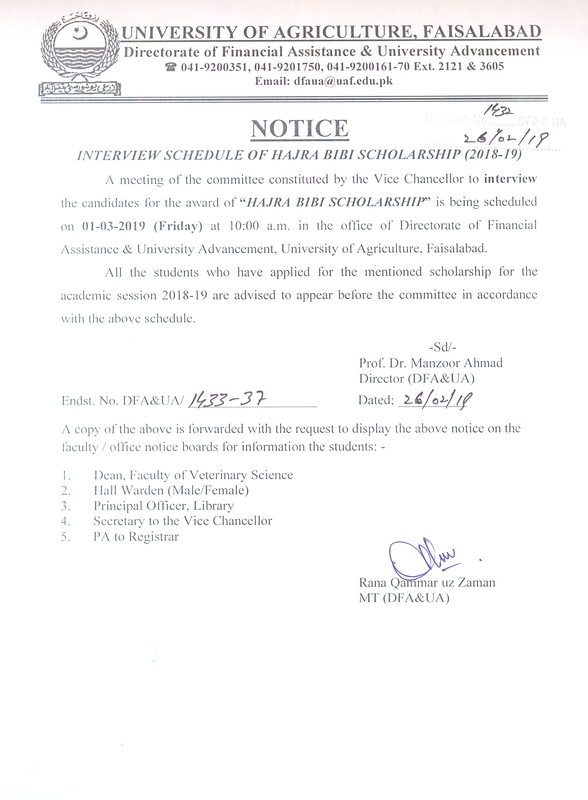 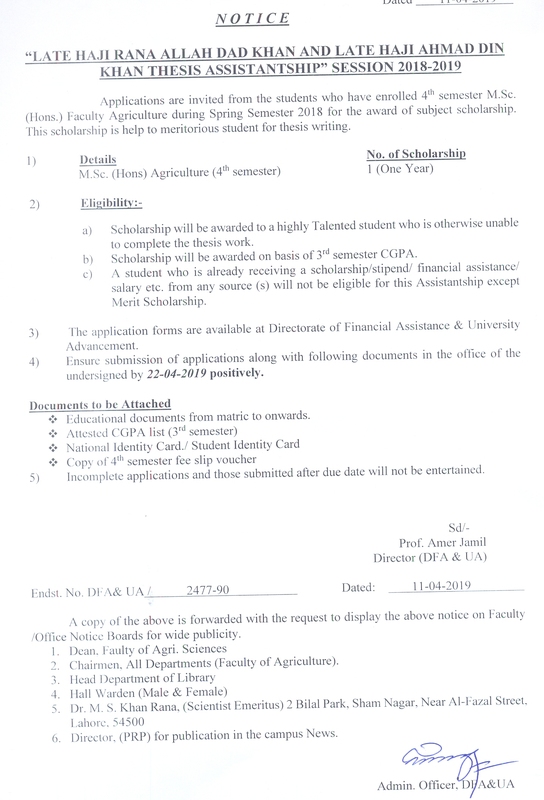 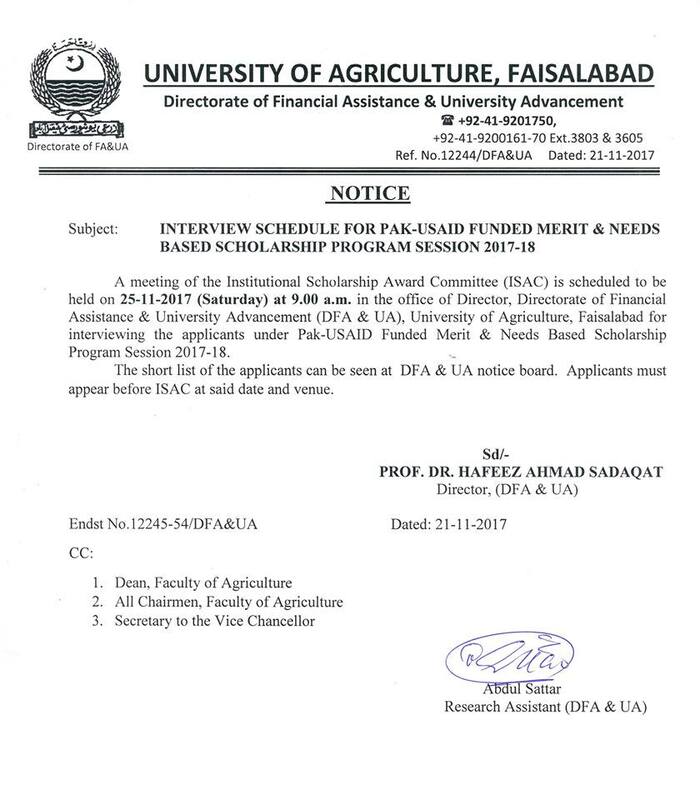 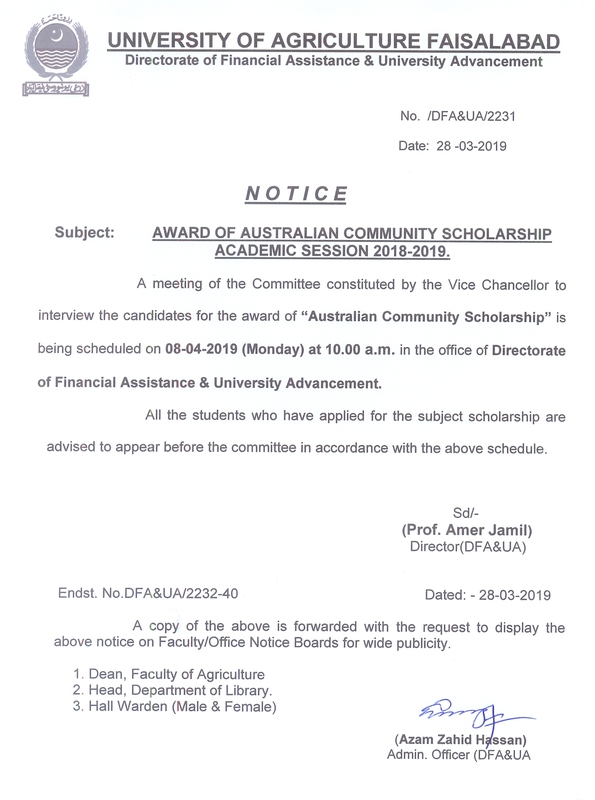 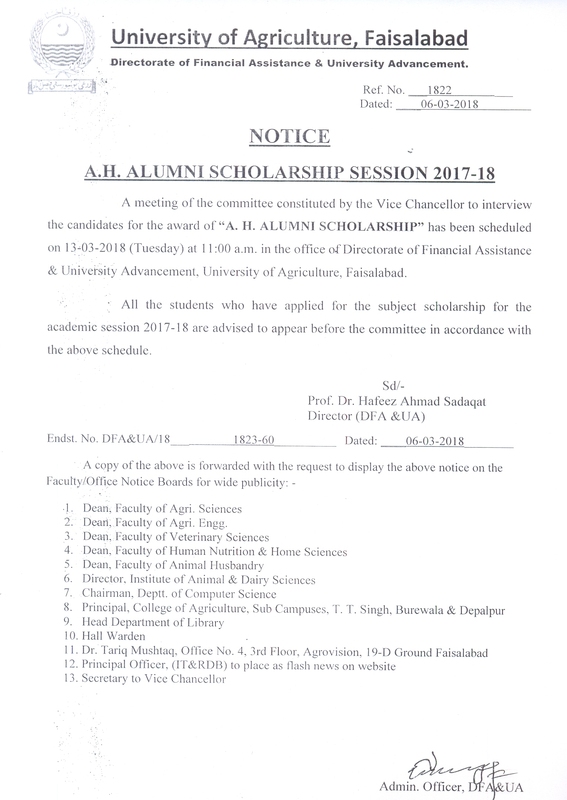 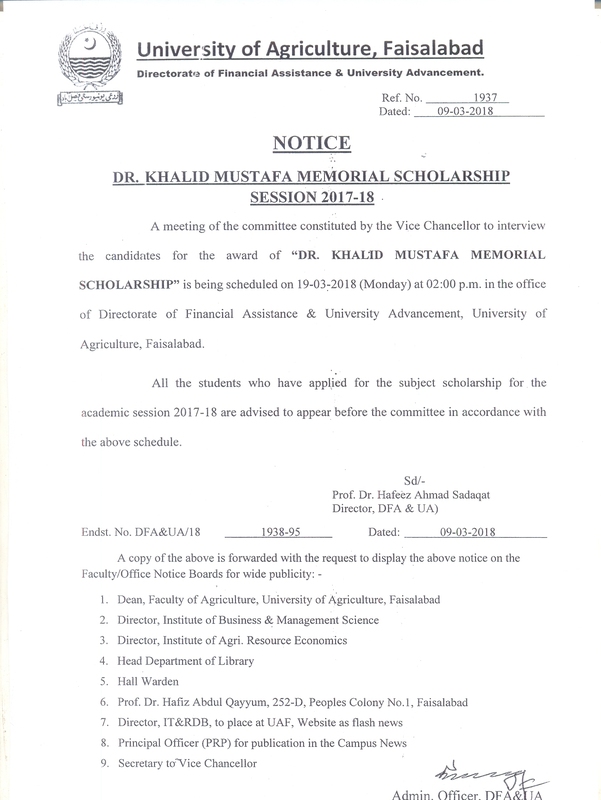 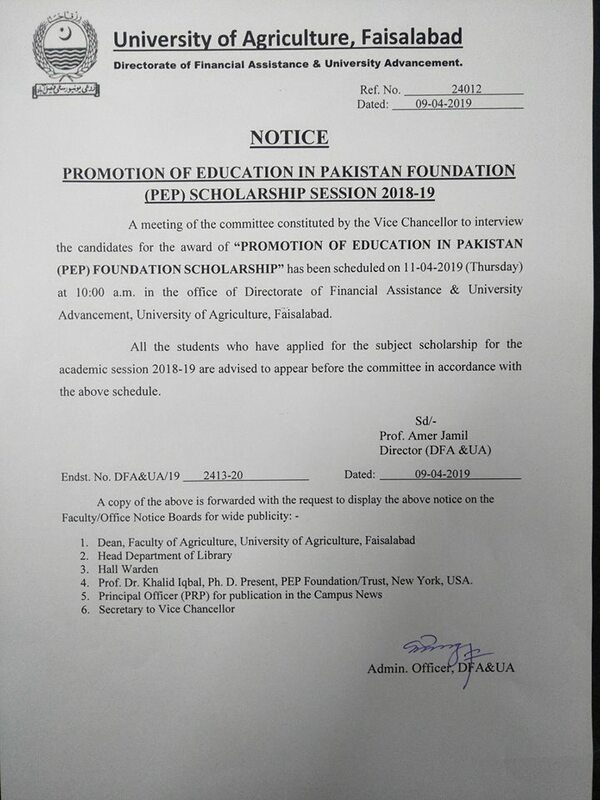 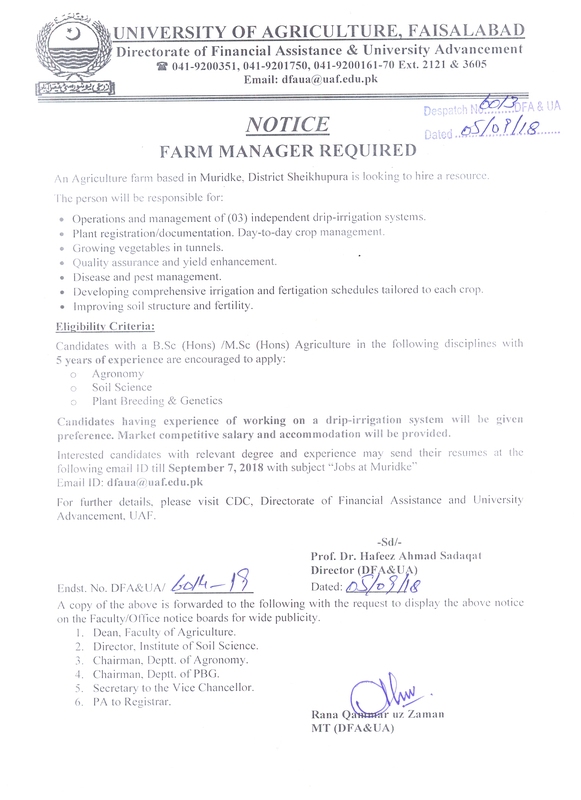 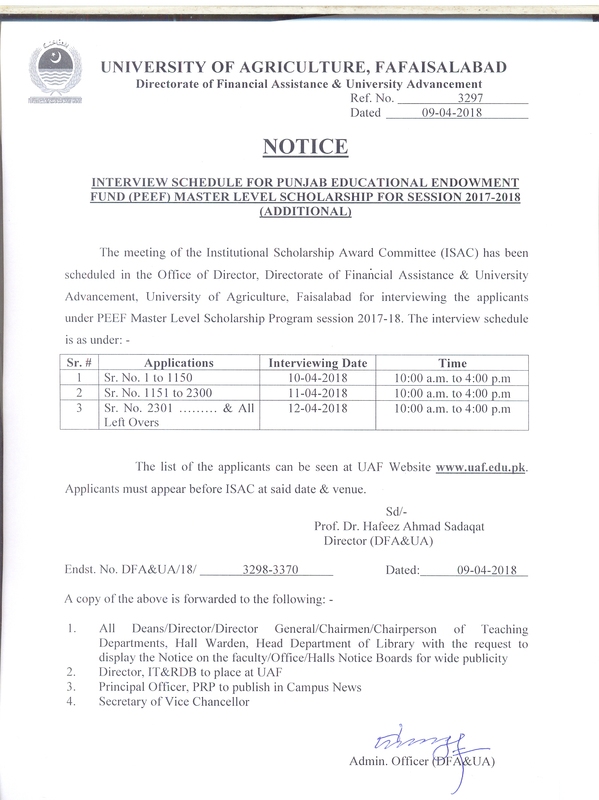 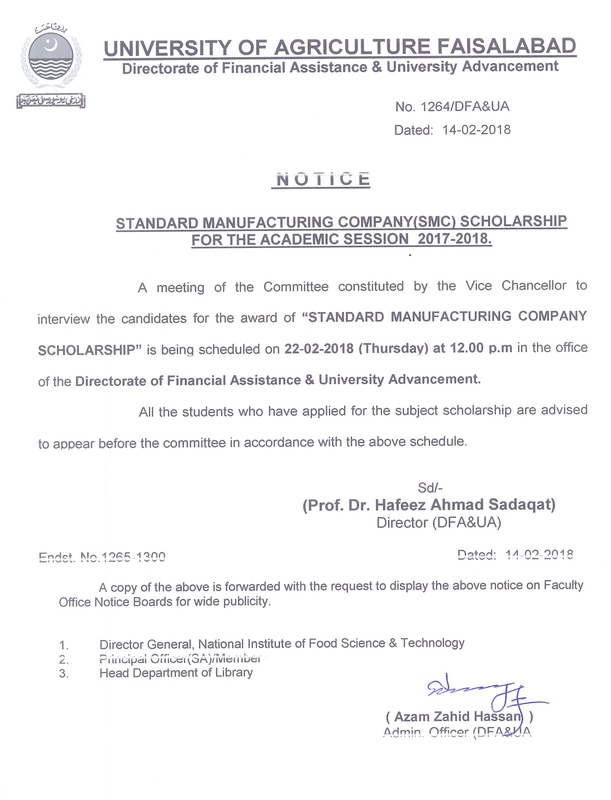 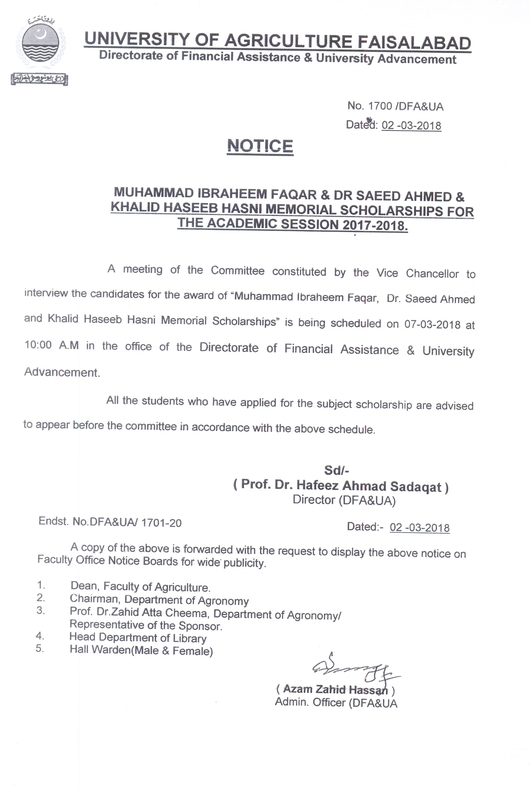 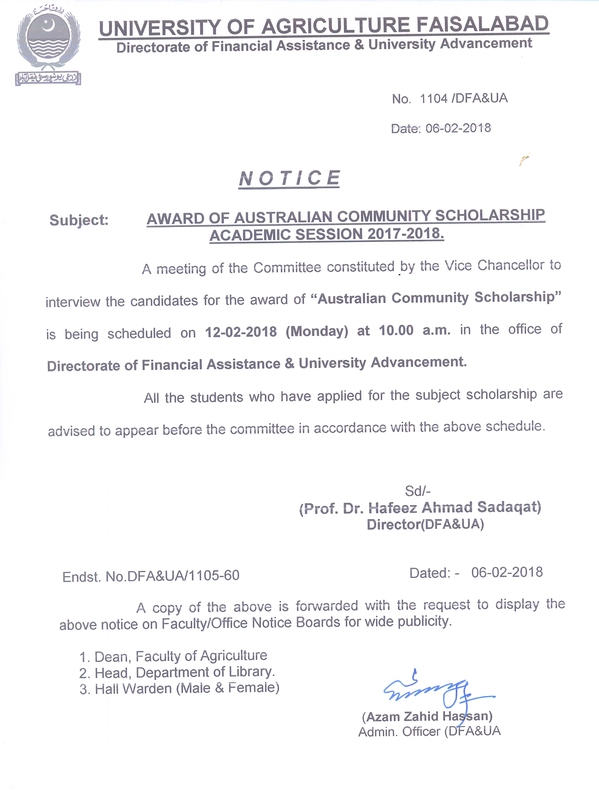 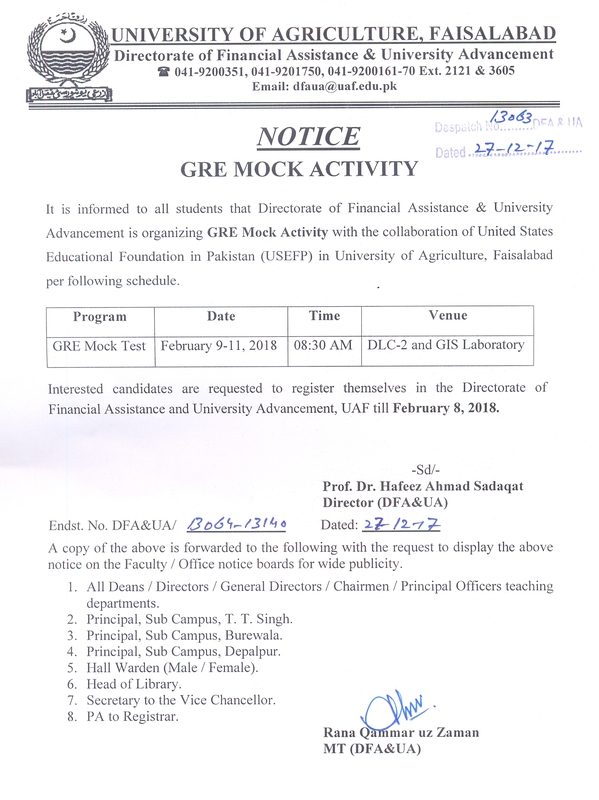 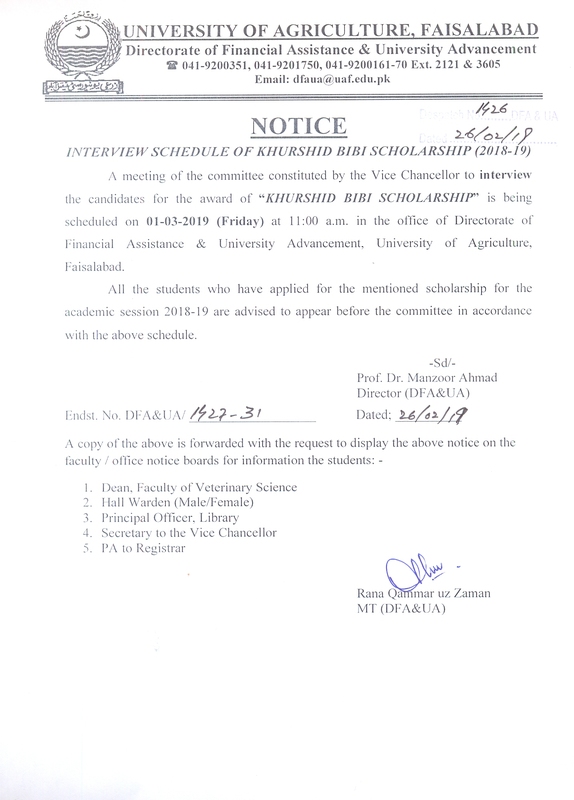 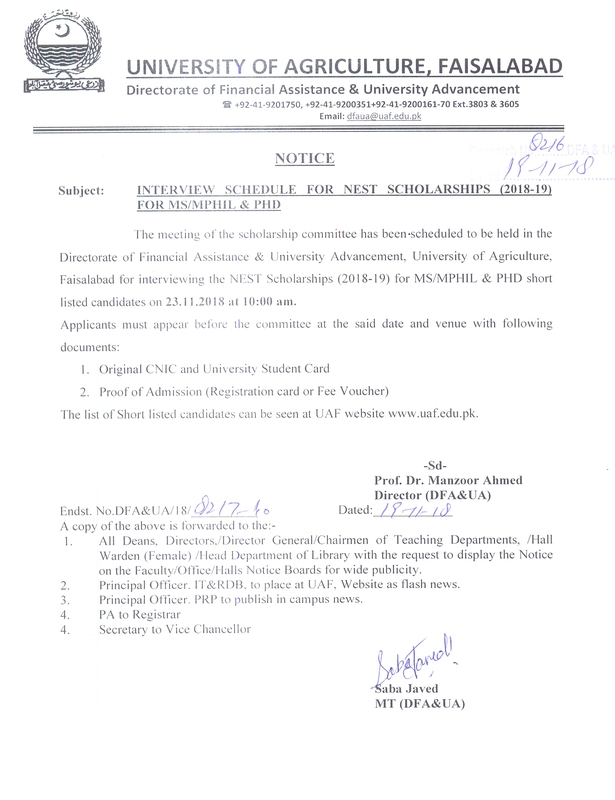 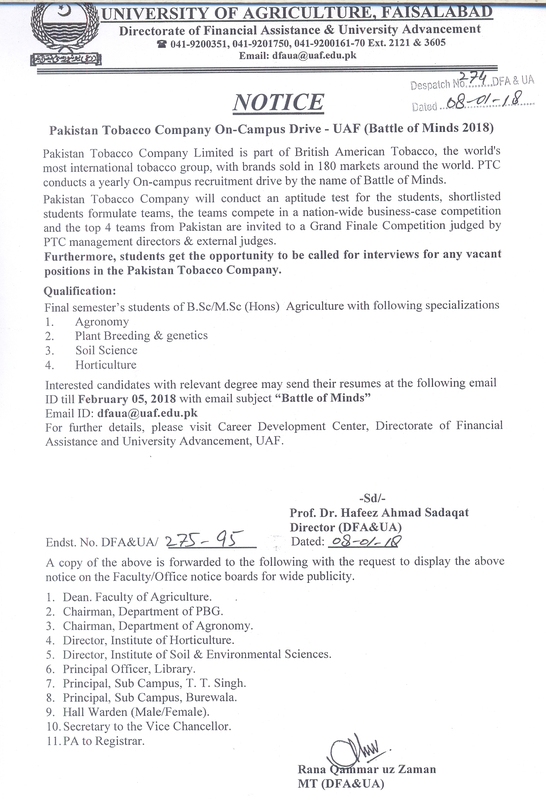 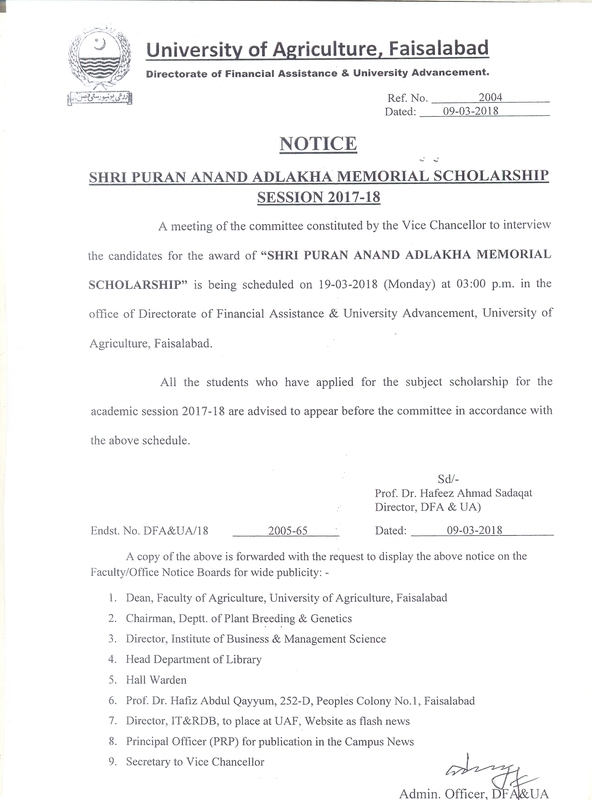 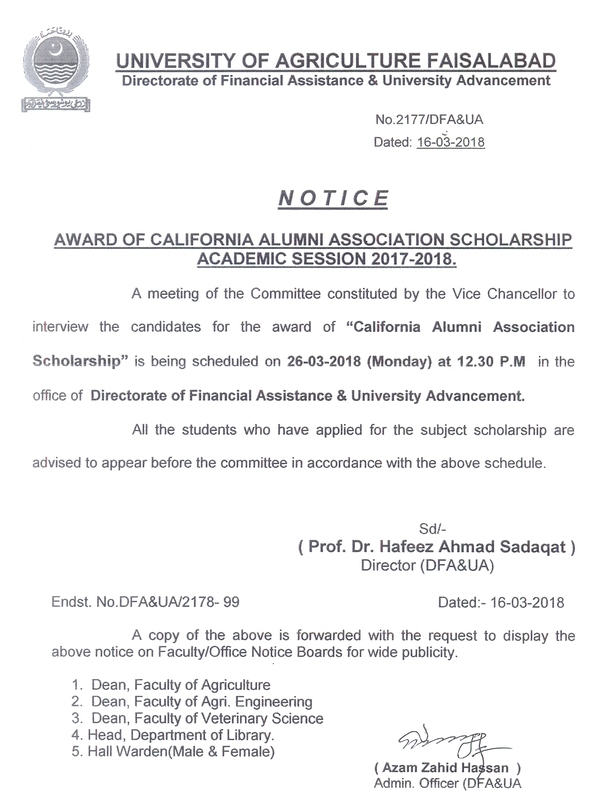 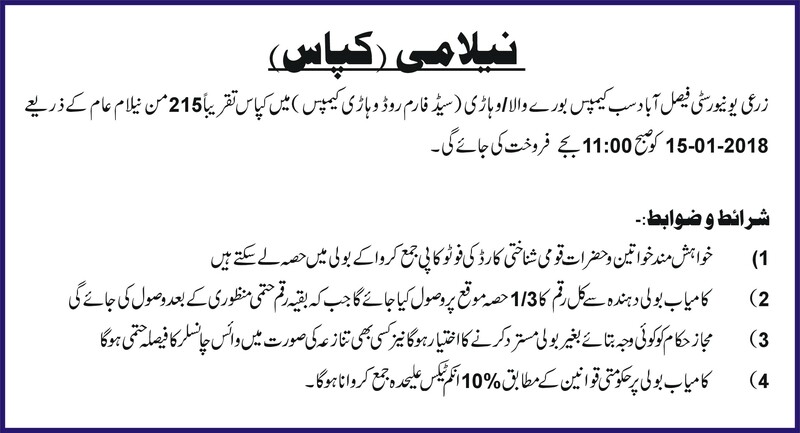 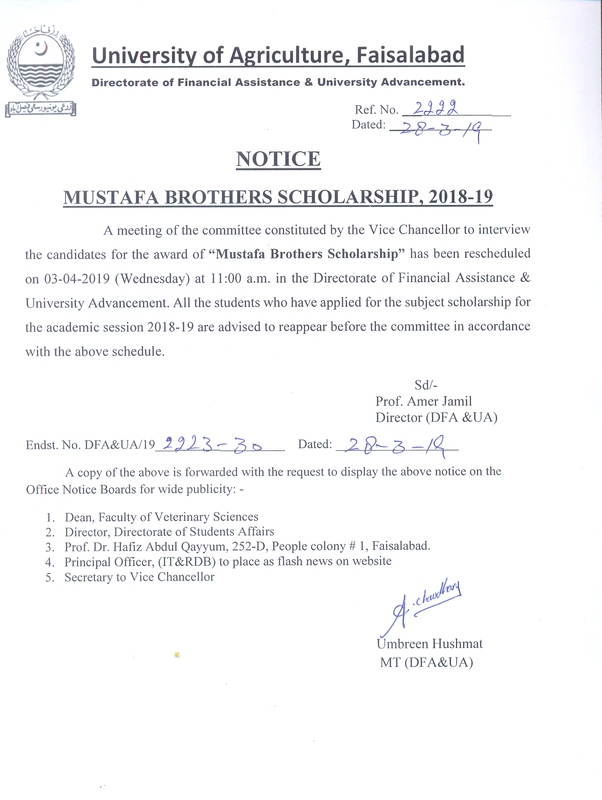 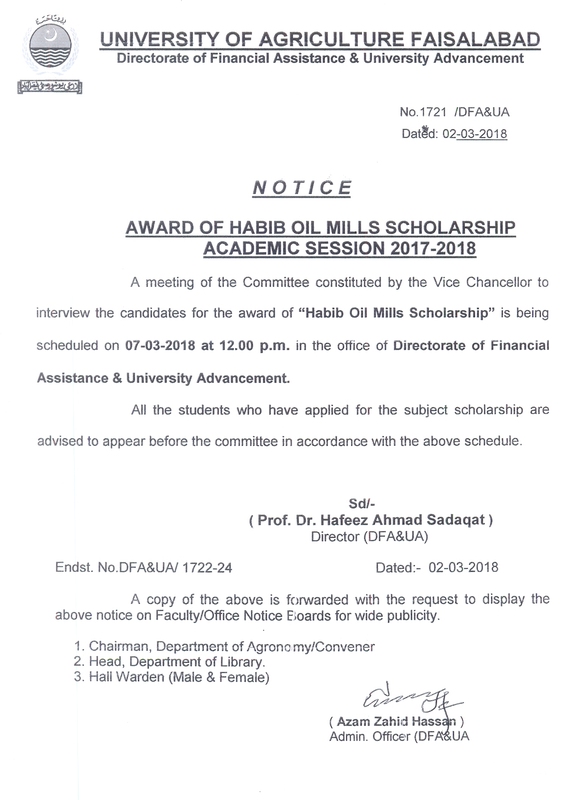 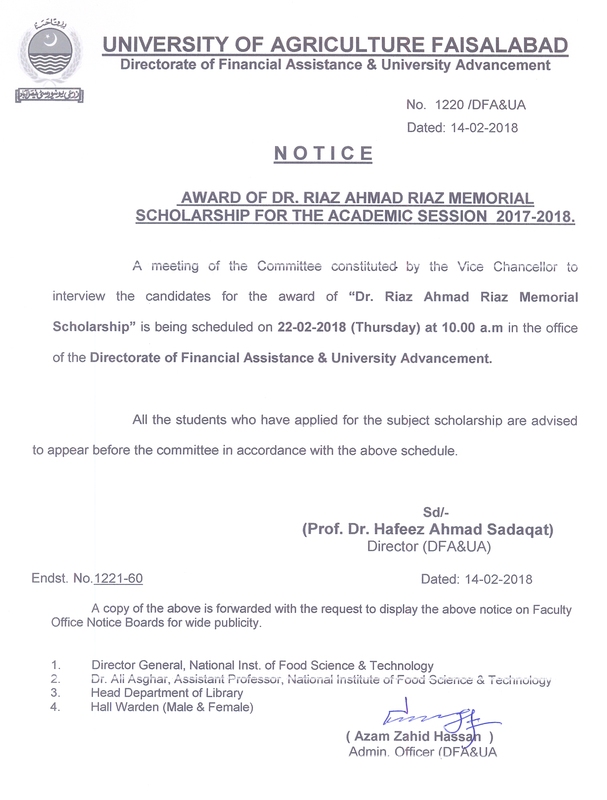 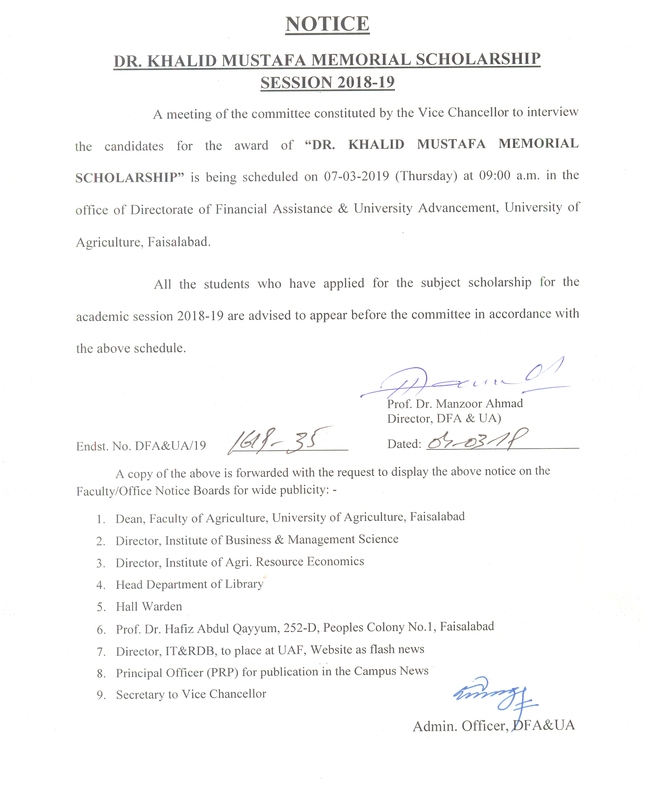 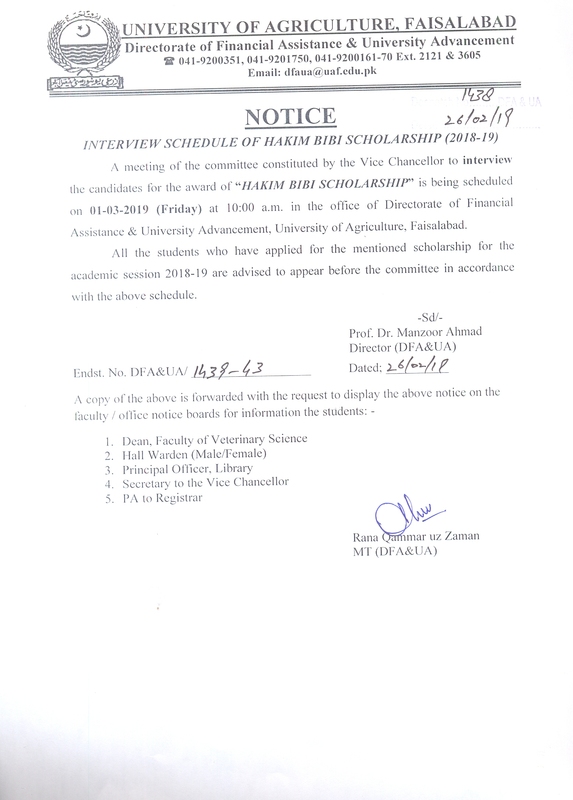 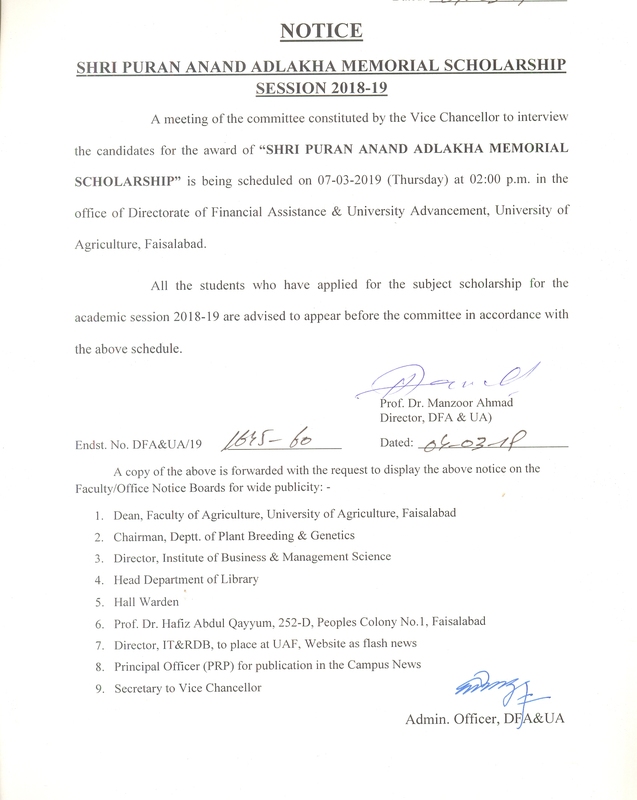 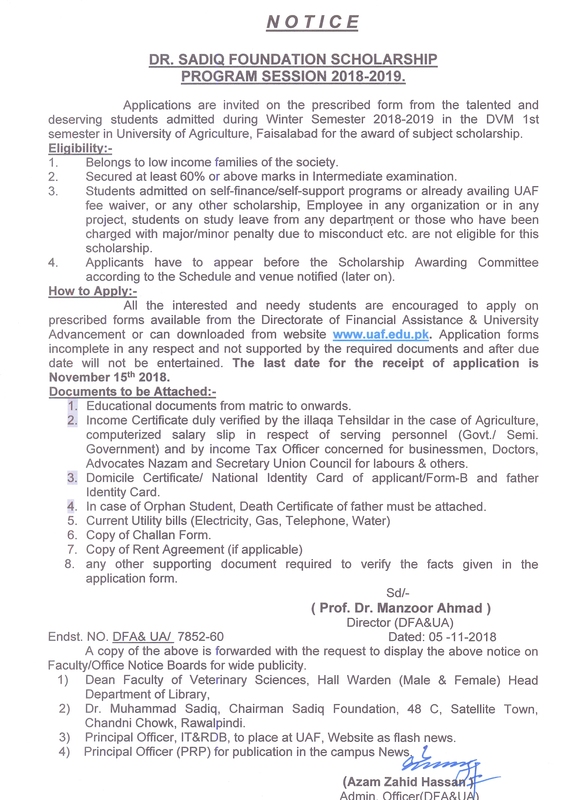 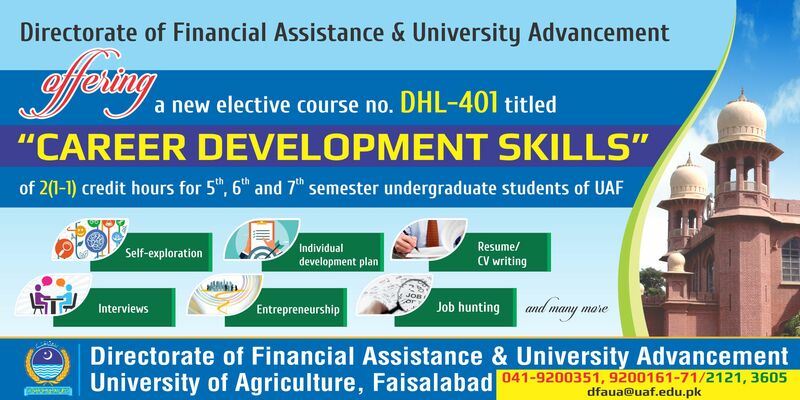 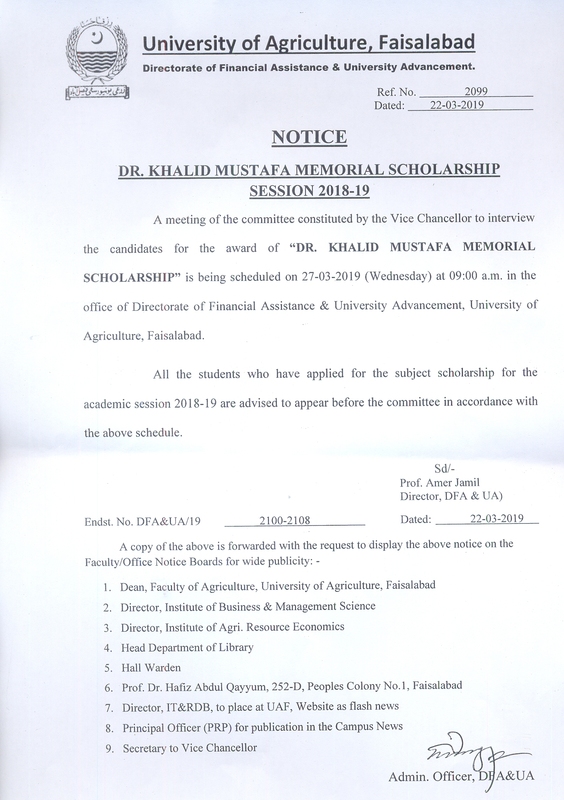 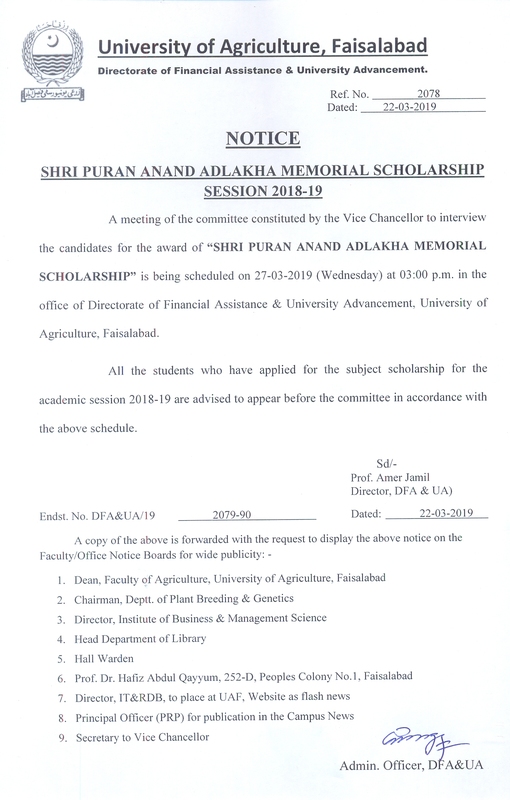 Official radio channel of University of Agriculture Faisalabad. 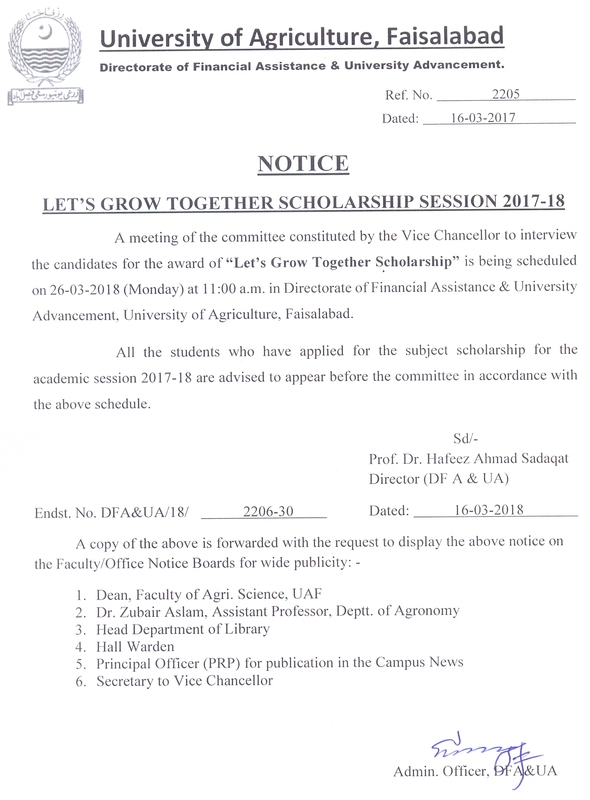 HortiMag UAF 2016-17 by Pakistan Society of Horticultural Sciences. 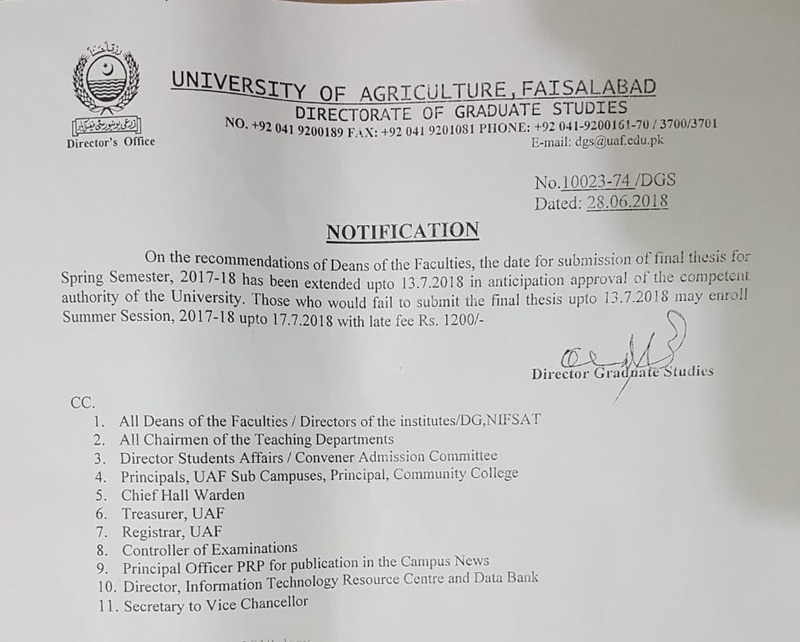 UNIVERSITY OF AGRICULTURE WILL REMAIN CLOSE AT 02-NOVEMBER-2018. 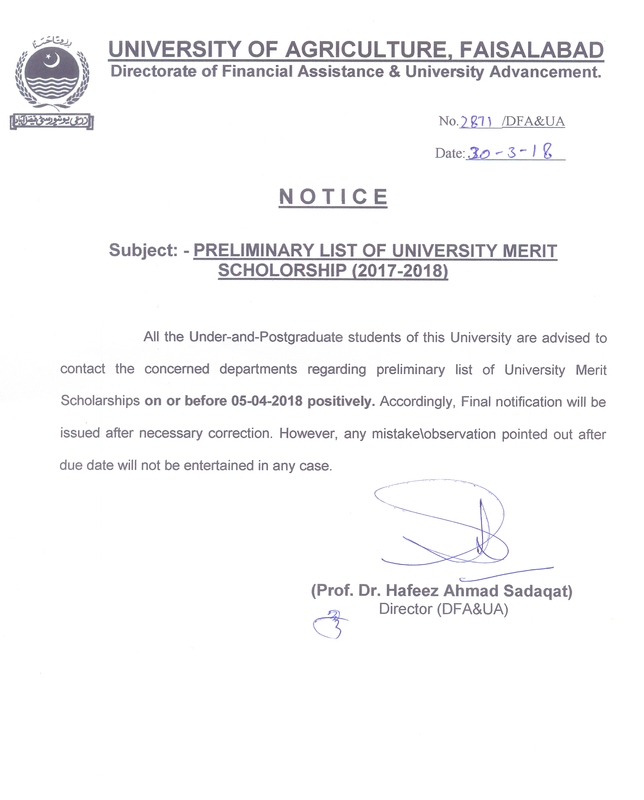 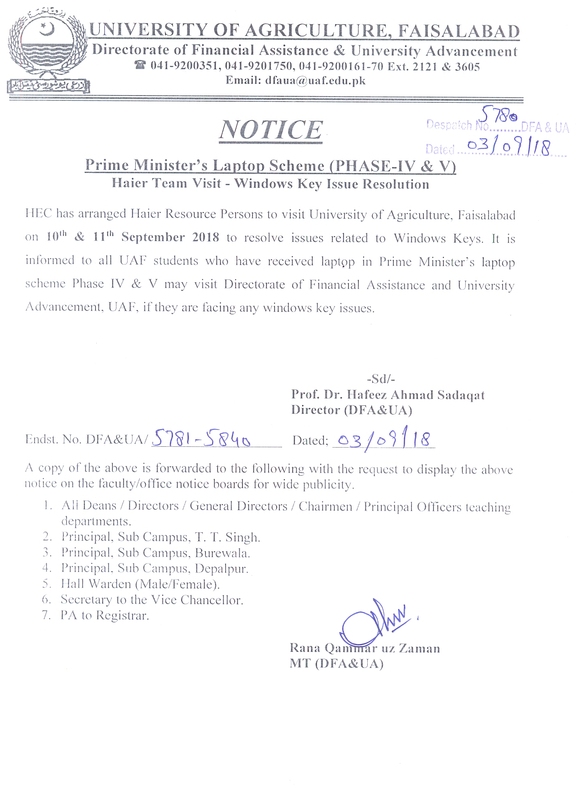 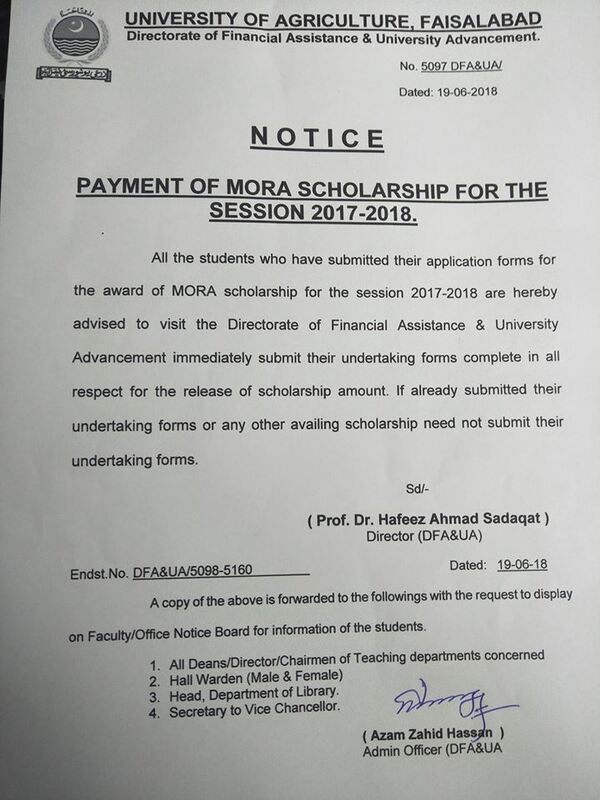 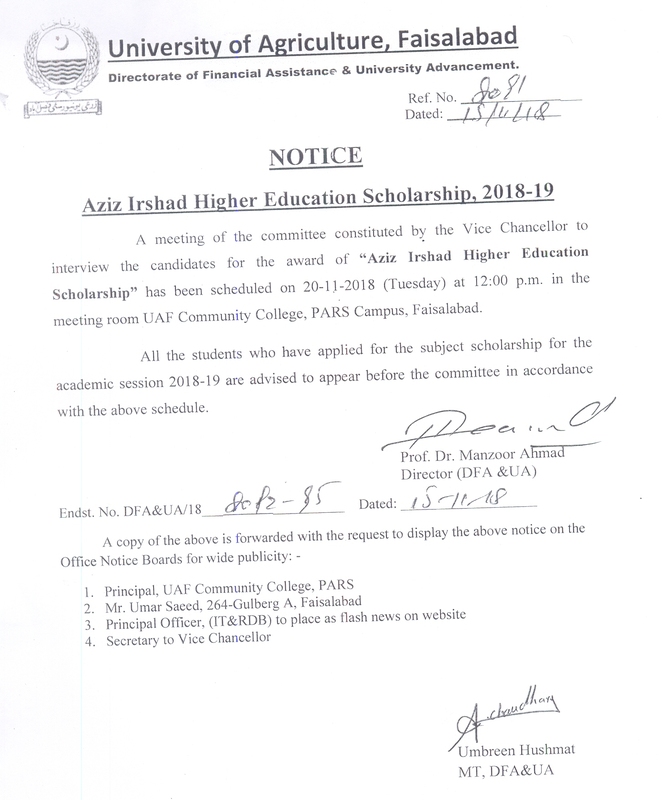 Tentative Merit list of 16 years, PM Laptop Phase 4 & 5. 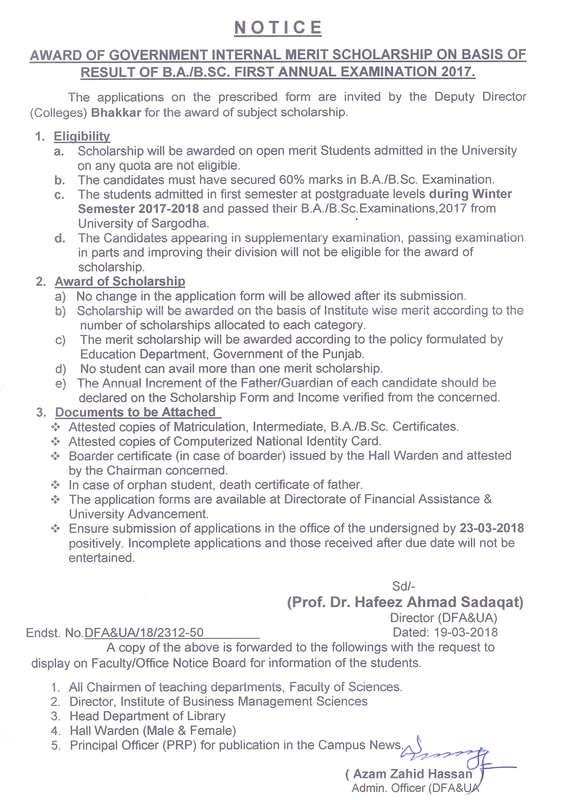 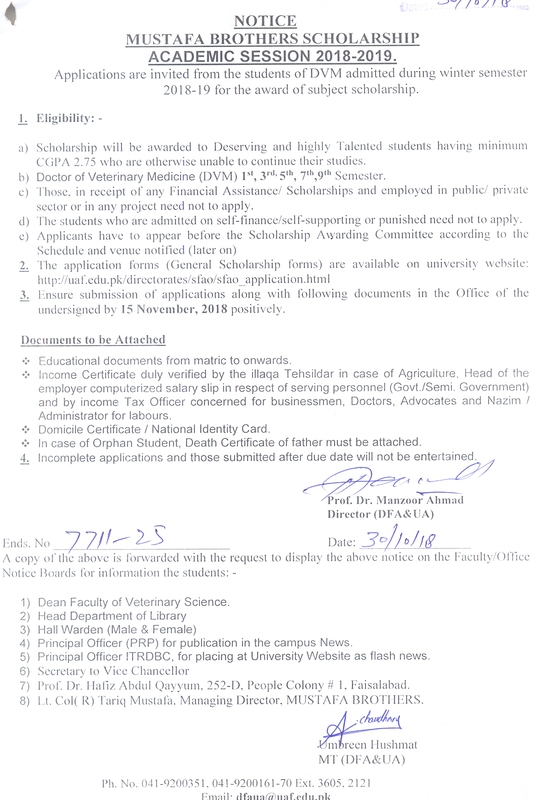 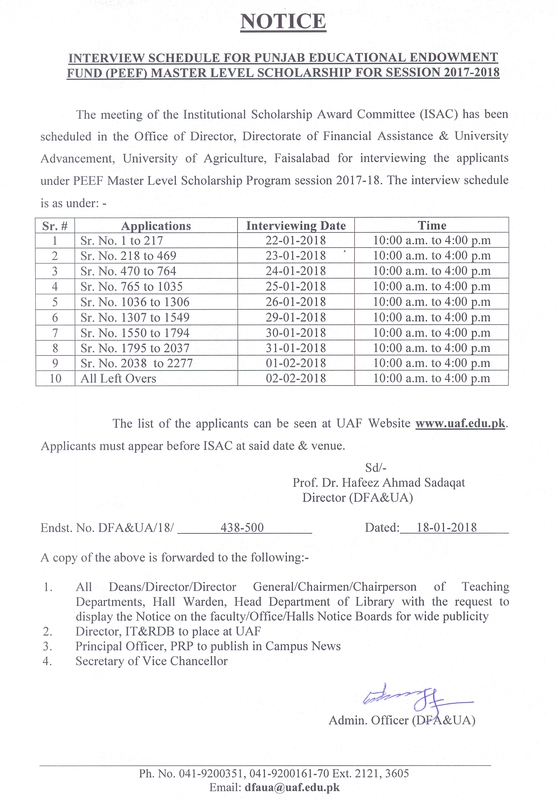 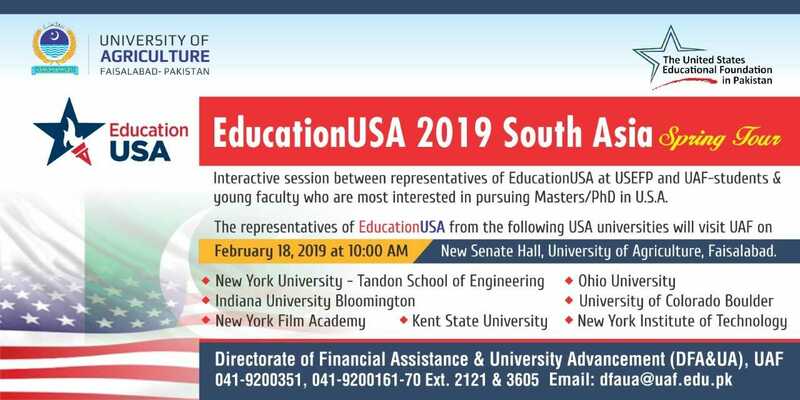 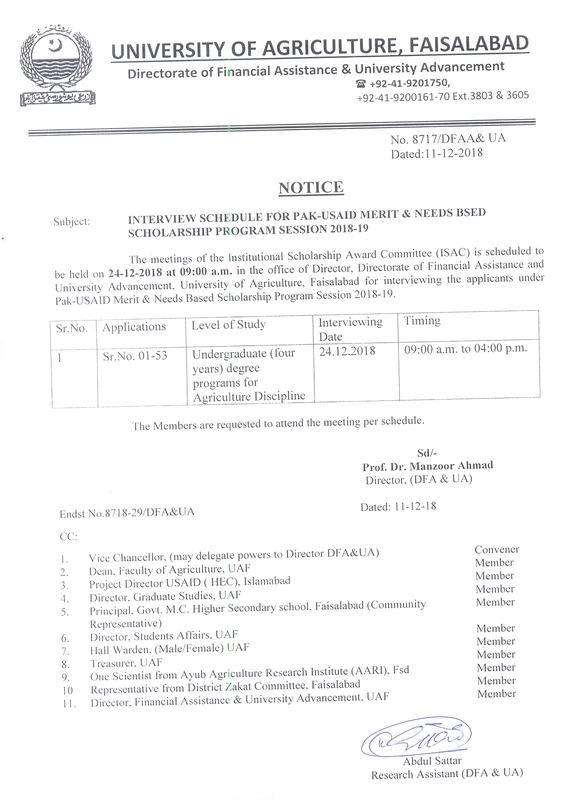 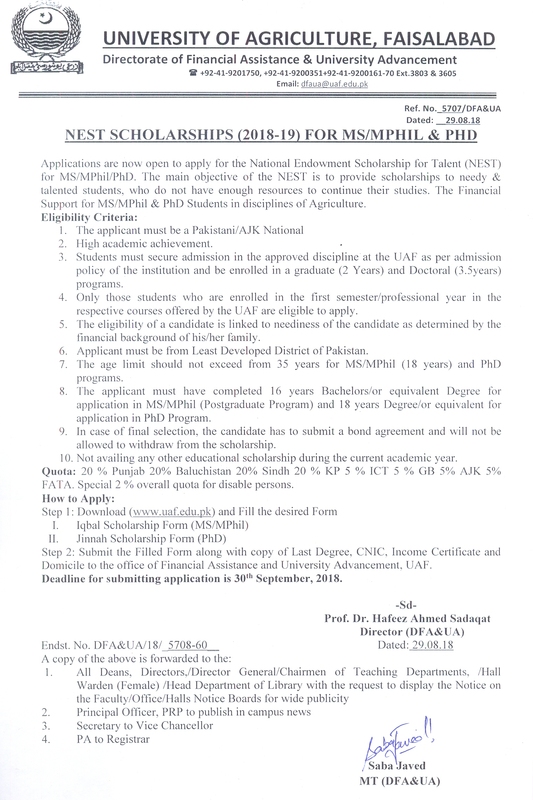 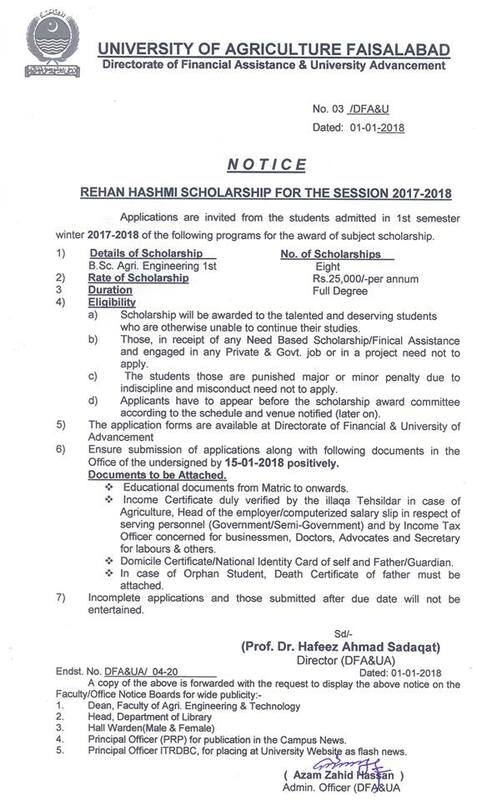 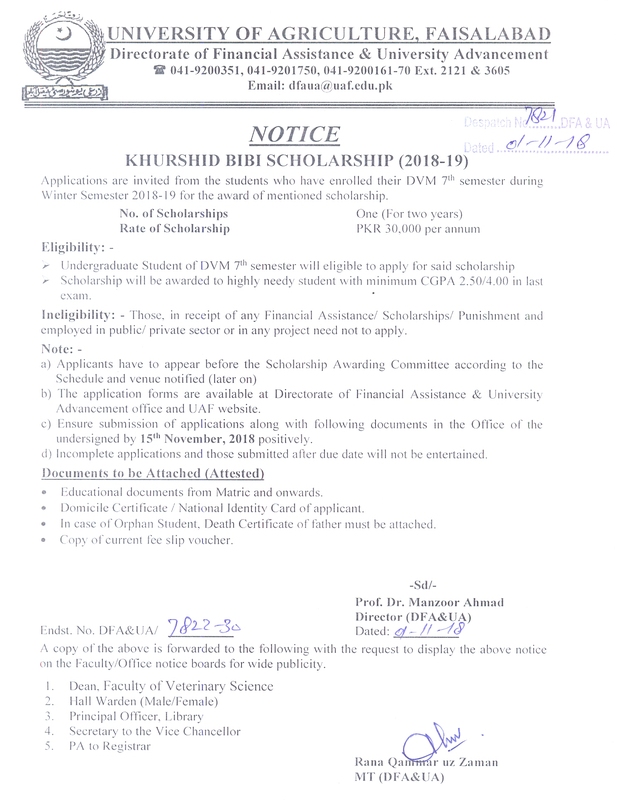 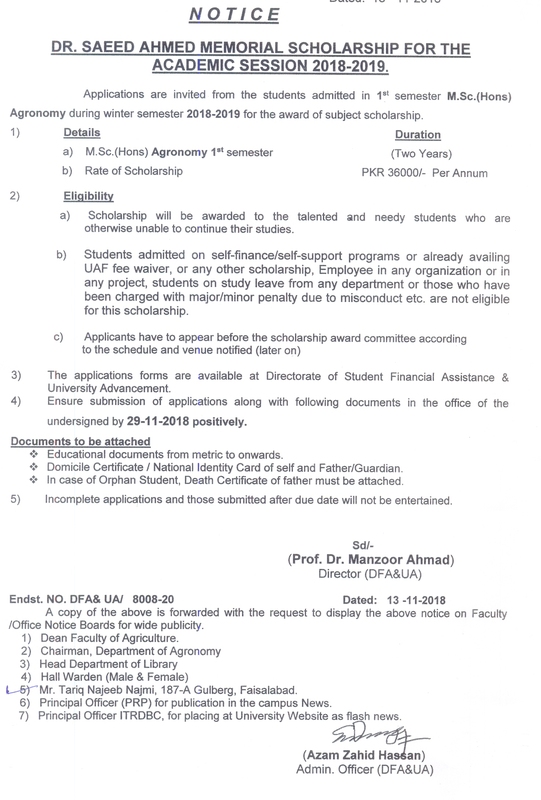 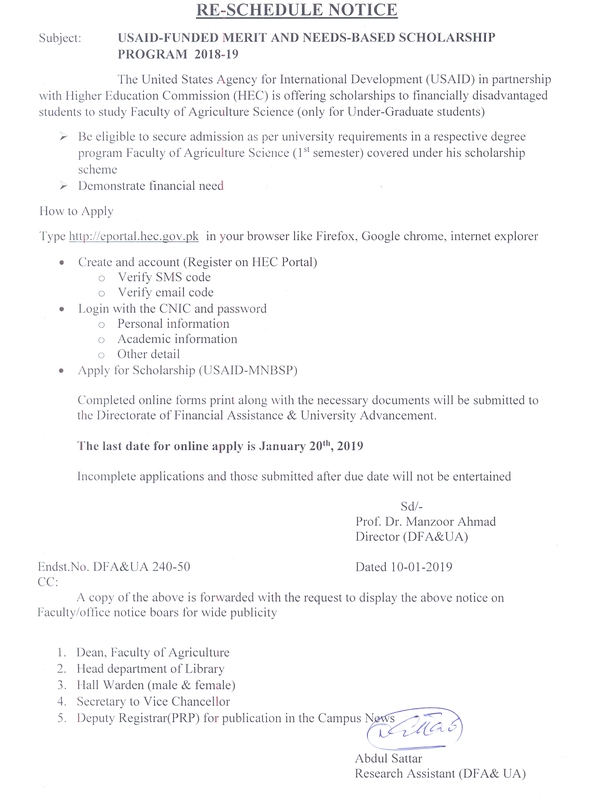 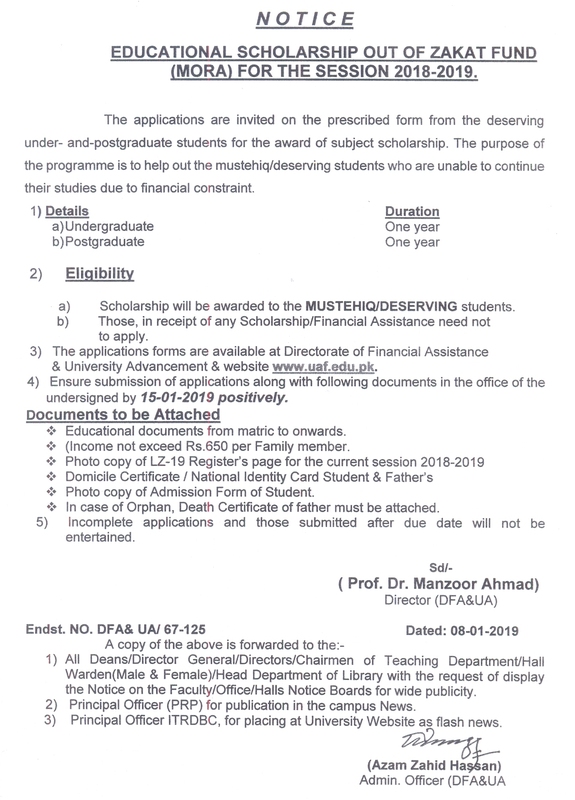 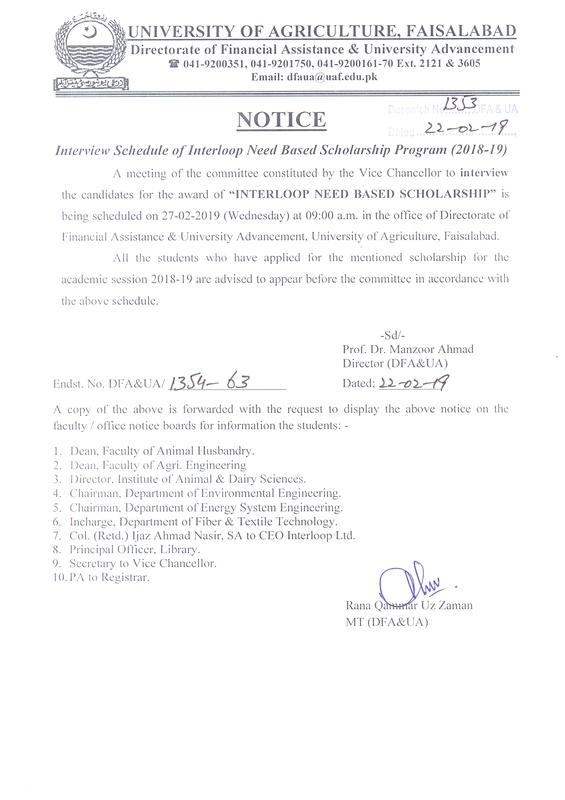 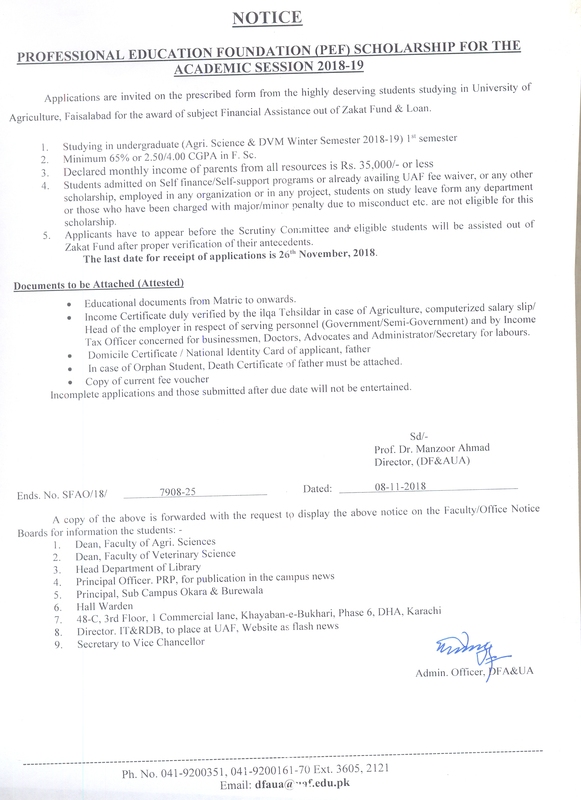 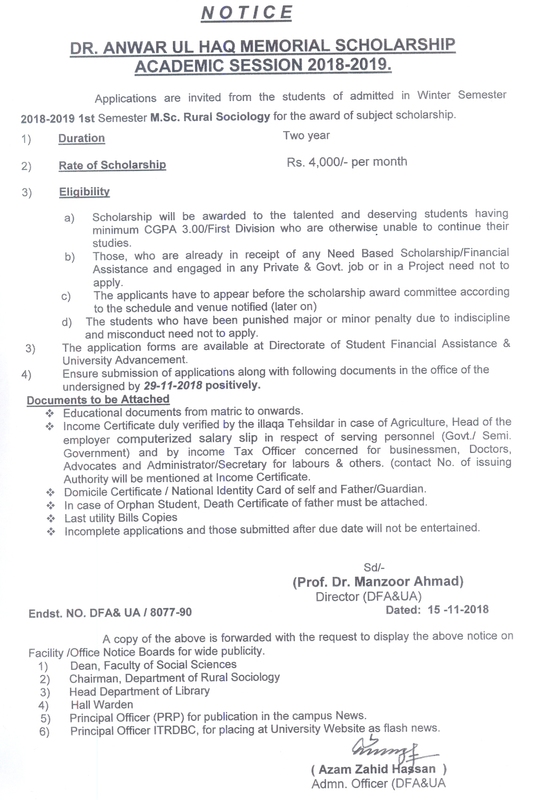 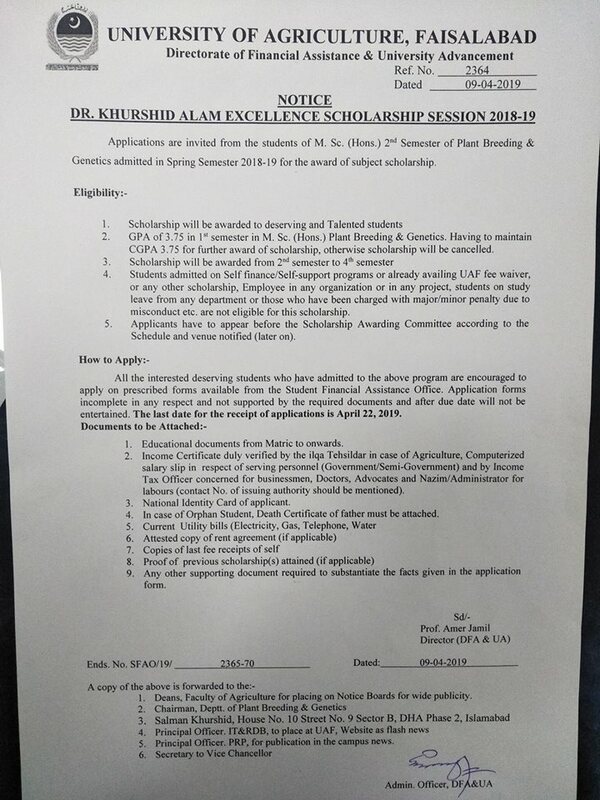 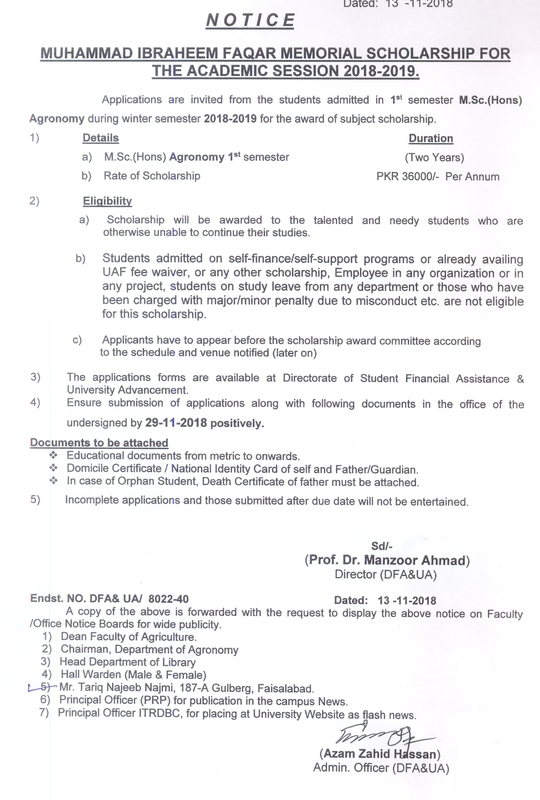 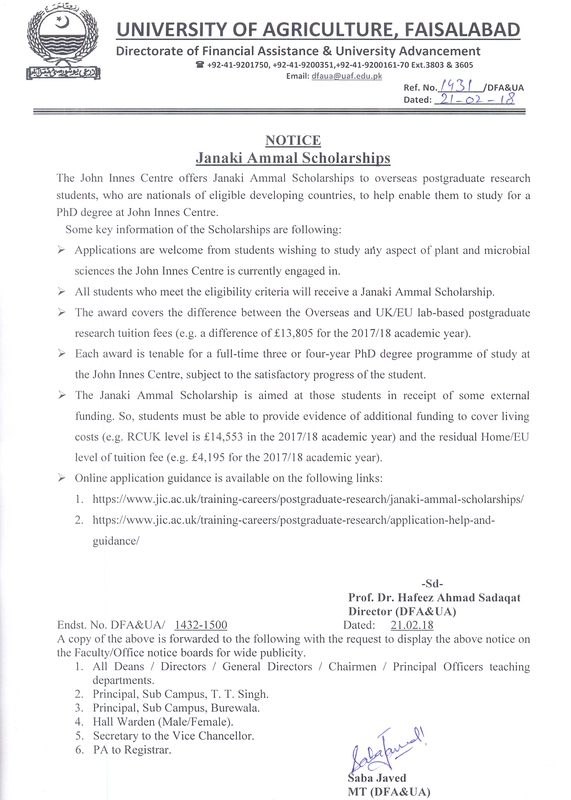 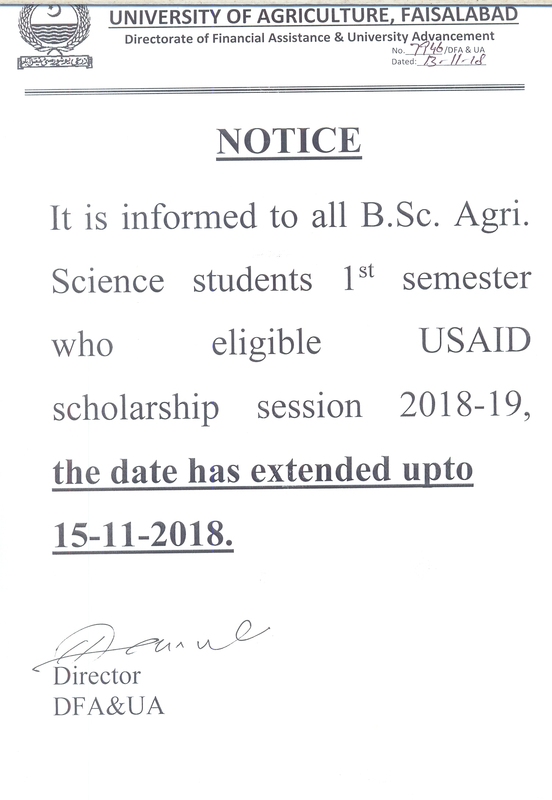 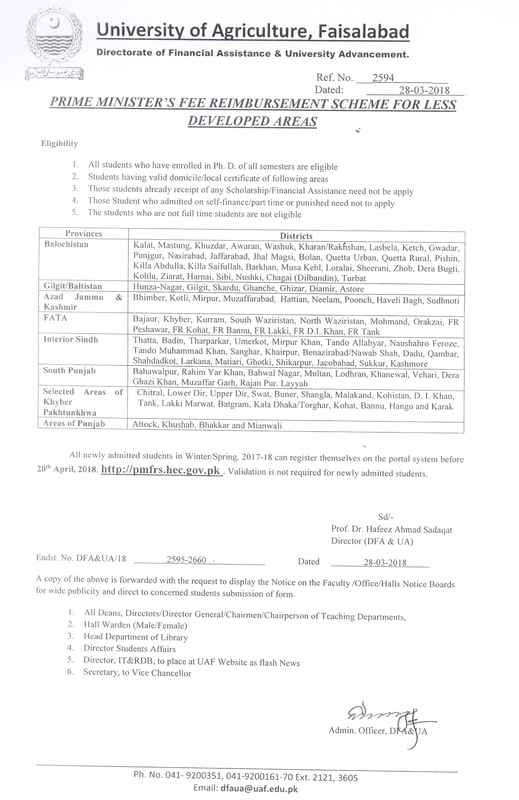 The Universities of Akdeniz, Selcuk, Katsmanu and NAGIDE, Turkey announced exchange programs for students and academic staff of University of Agriculture, Faislabad under Mevlana Exchange Program of Turkey.•	Last date to apply is 20th of Febuaury, 2018 •	For further detail/Assistance, Please contact Office of the Director External Linkages, UAF del@uaf.edu.pk ; uaf_rashid@yahoo.com 0092-41- 9200161/2913. 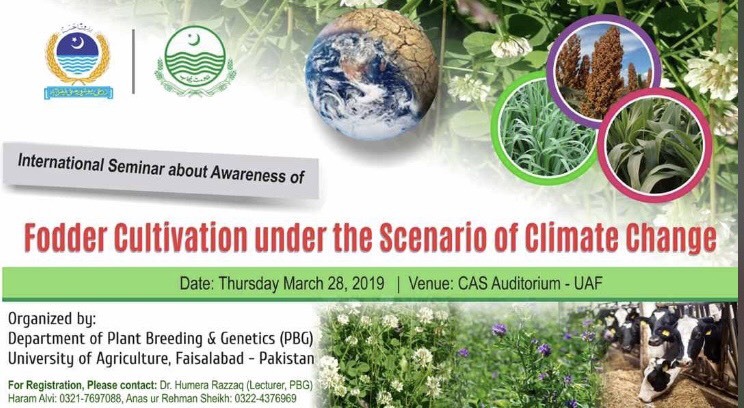 Hashoo Foundation has launched a documentary competition to raise awareness about the deleterious impacts of Environmental Degradation, and Climate Induced Disasters. 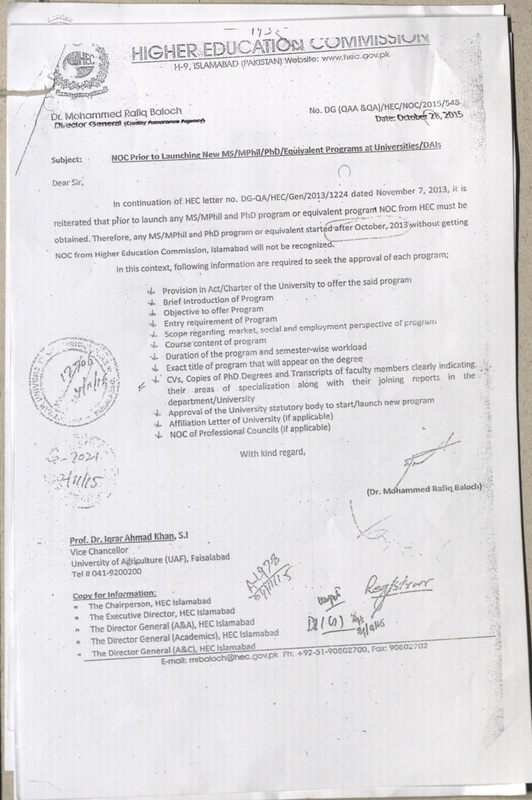 Higher Education Commission & Microsoft are collaborating to bring Microsoft's Imagine Cup. 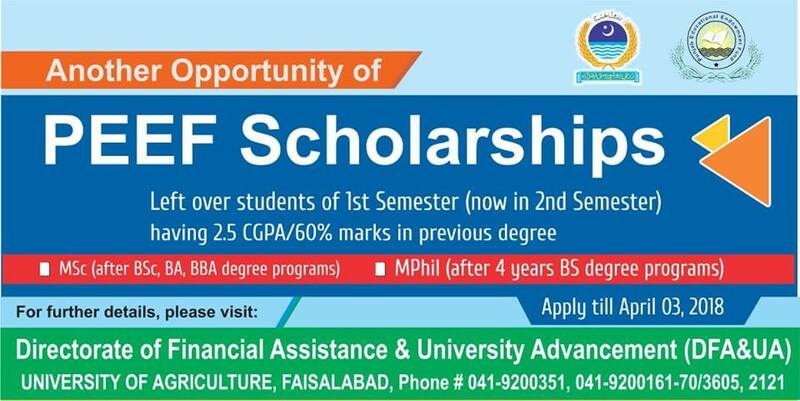 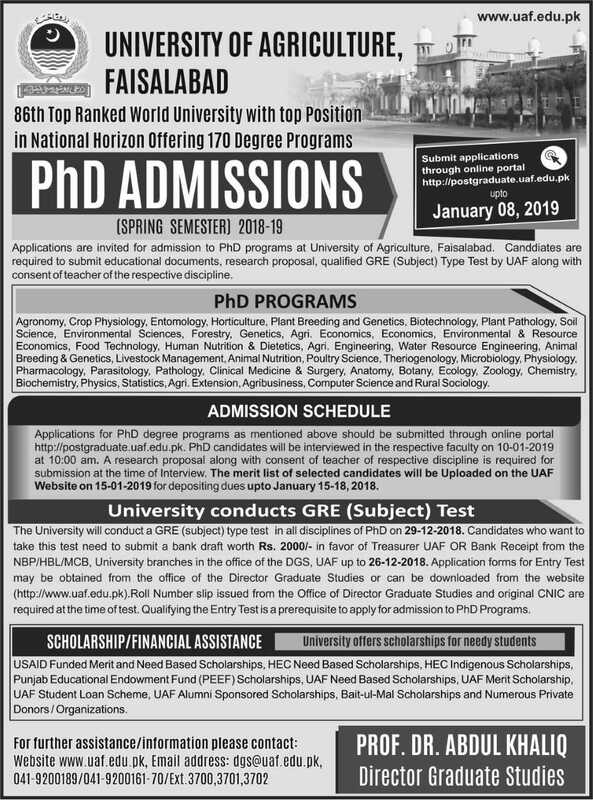 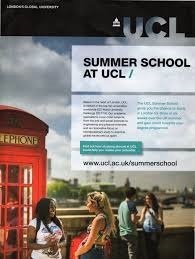 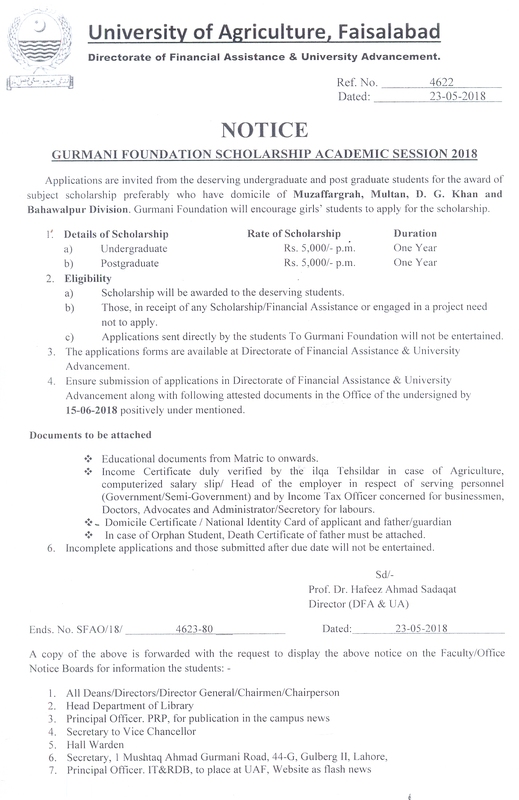 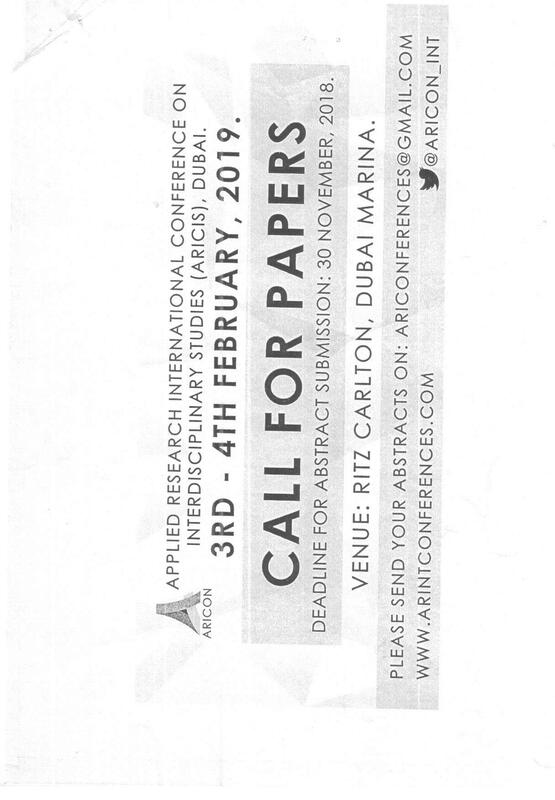 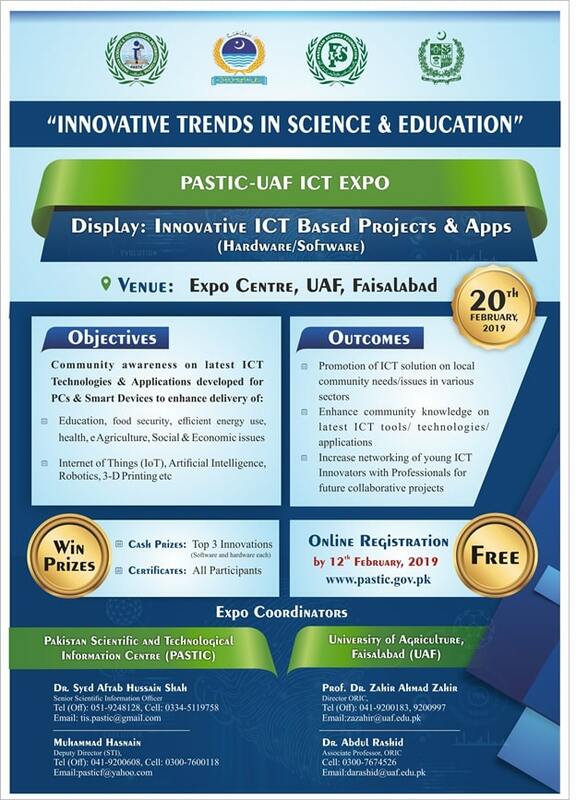 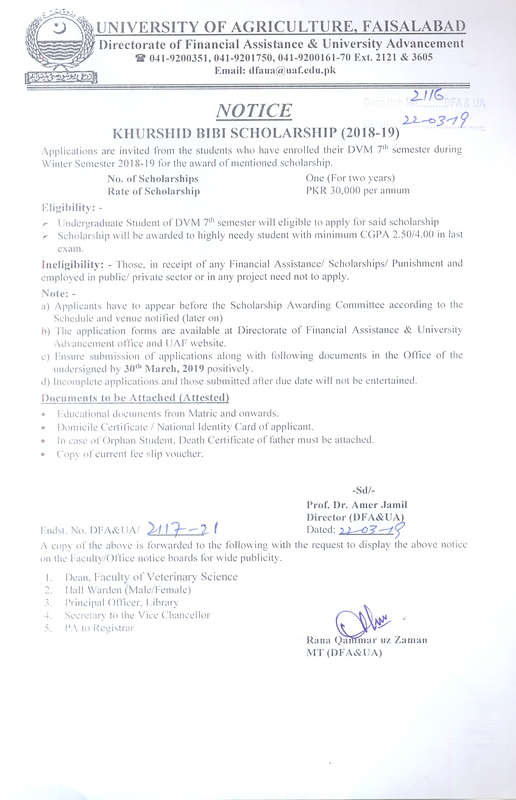 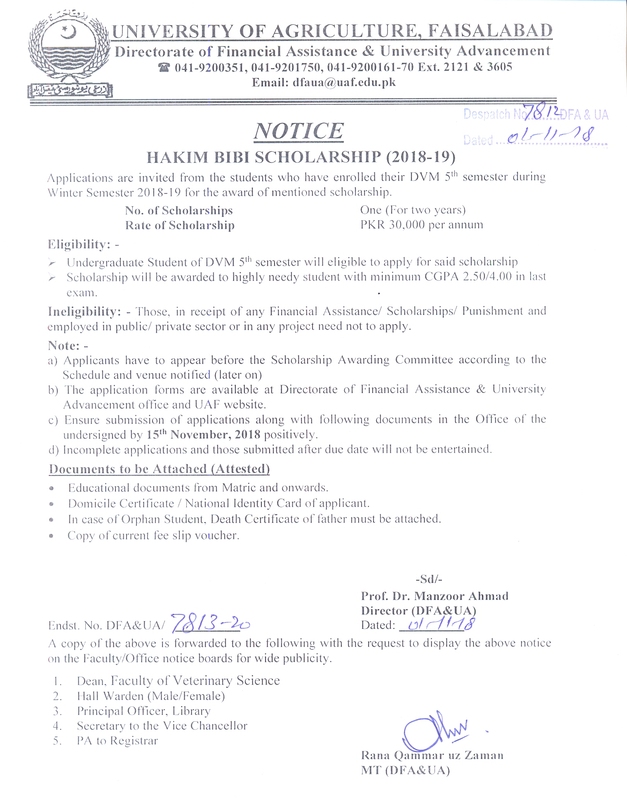 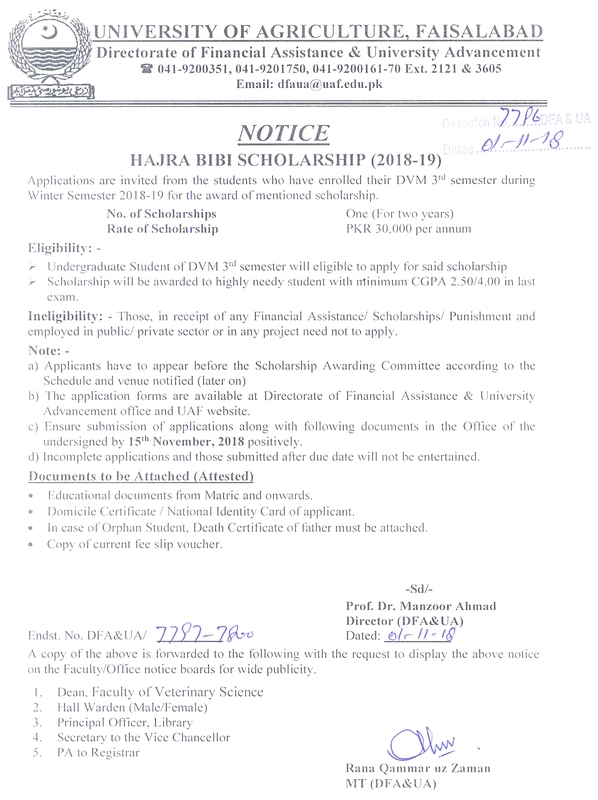 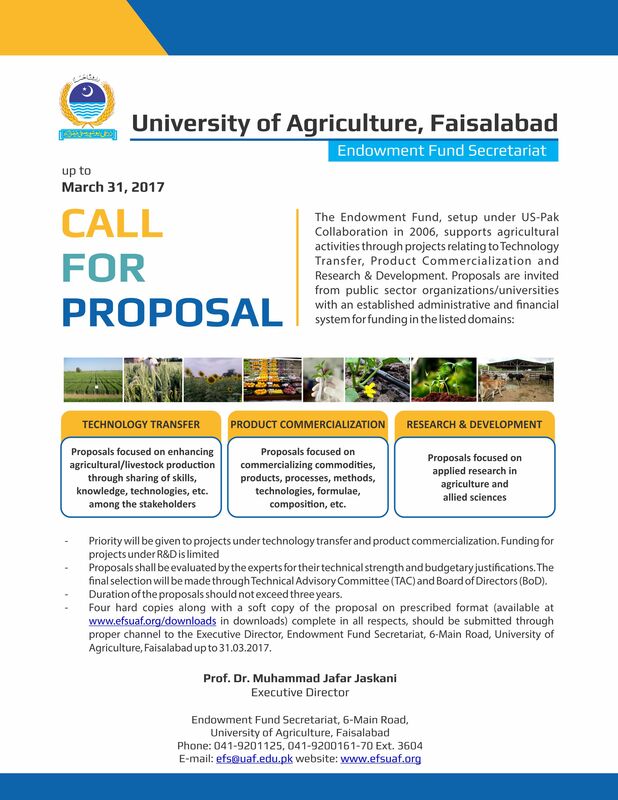 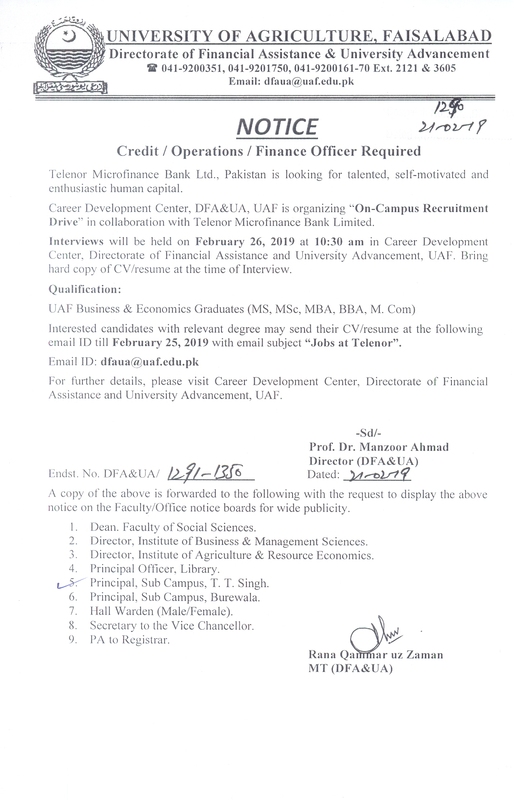 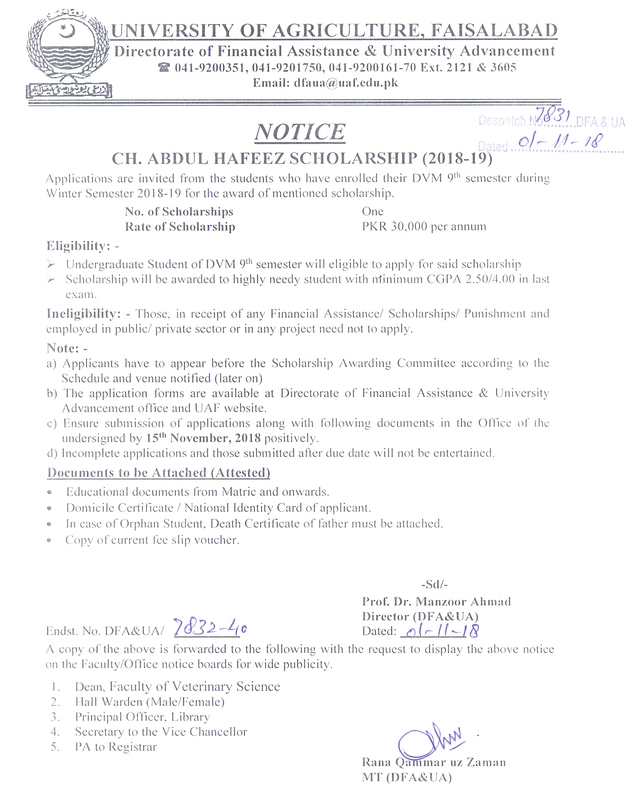 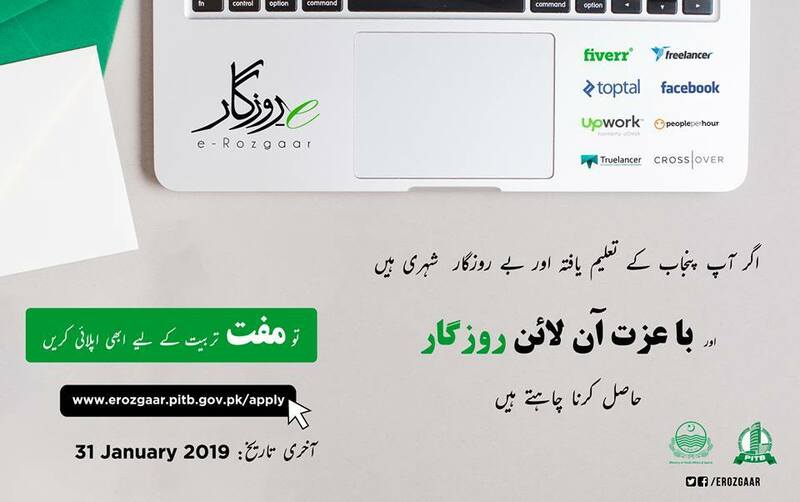 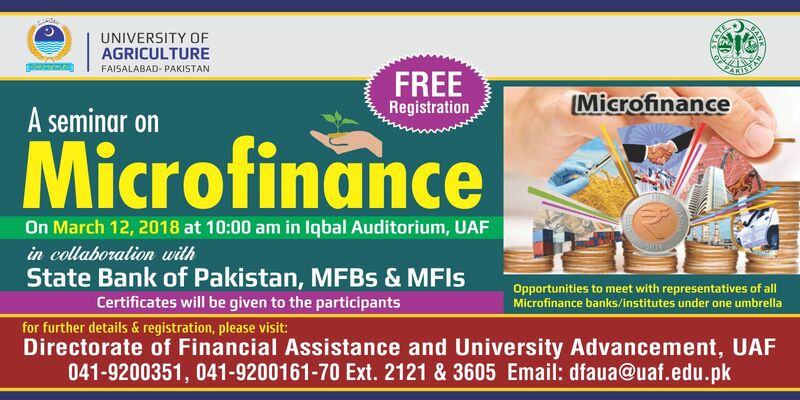 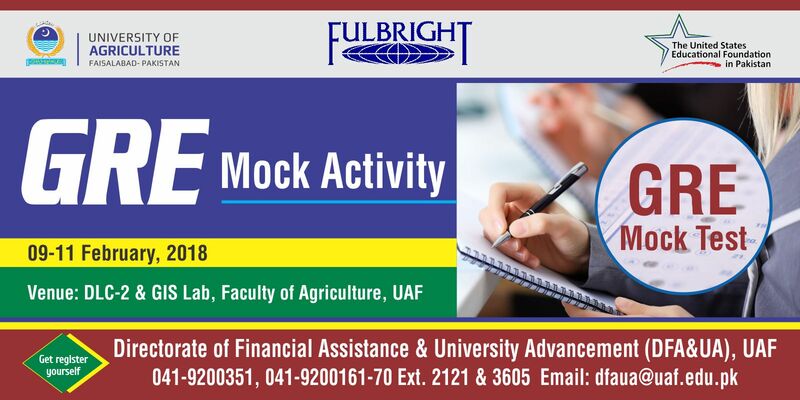 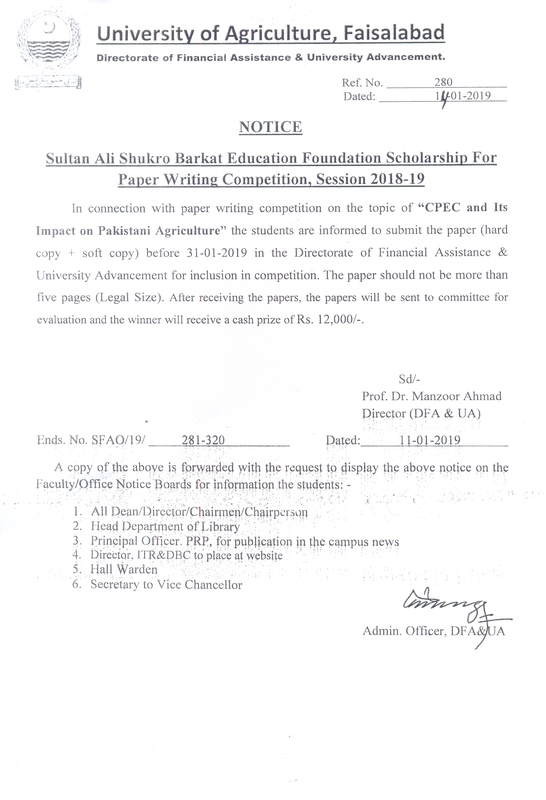 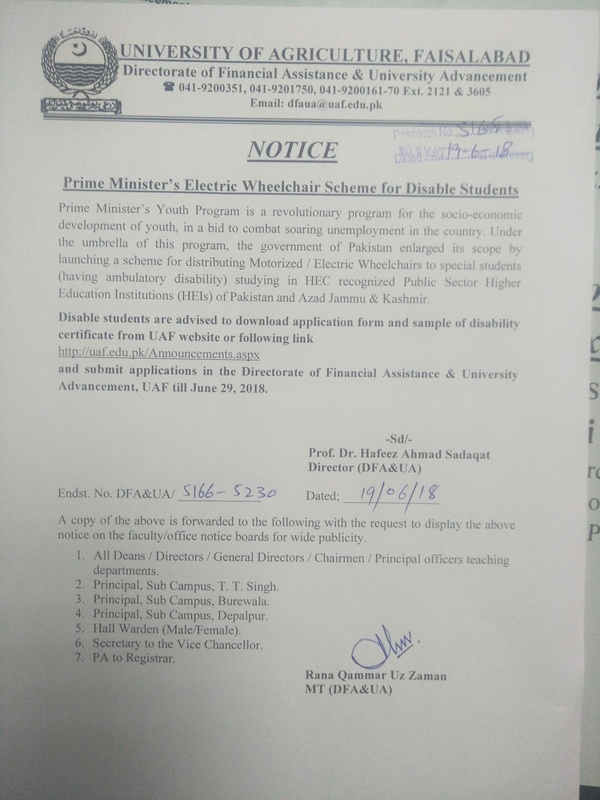 Contact IT office - UAF to submit your Project Details. 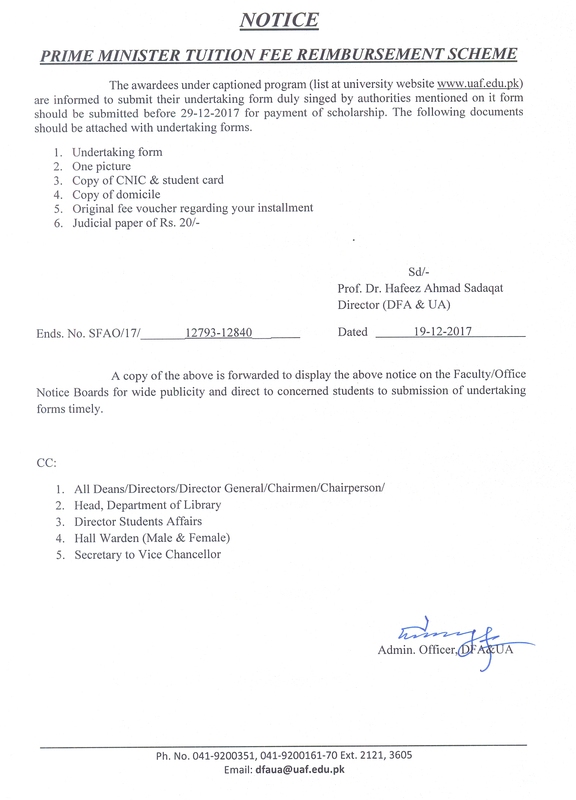 The Students who have not yet enrolled spring 2017-18 are advised to contact their respective office of the Dean/ Director/ Principal immediately but before 2nd February, 2018. 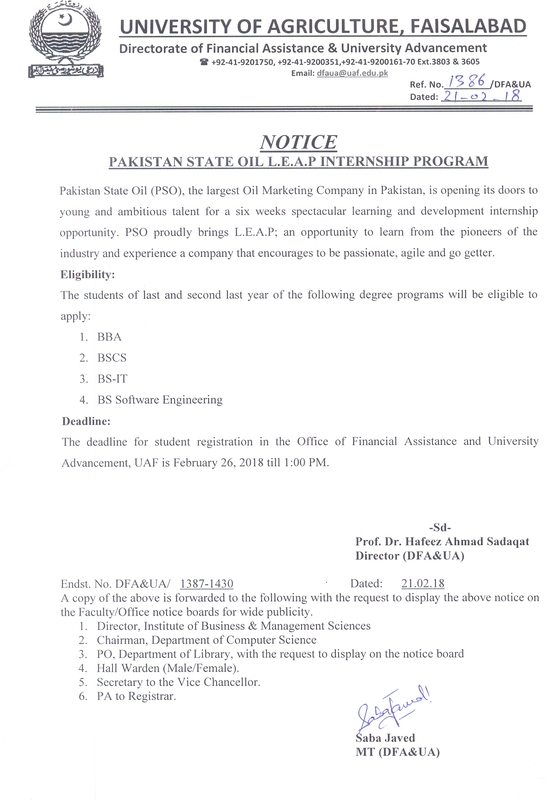 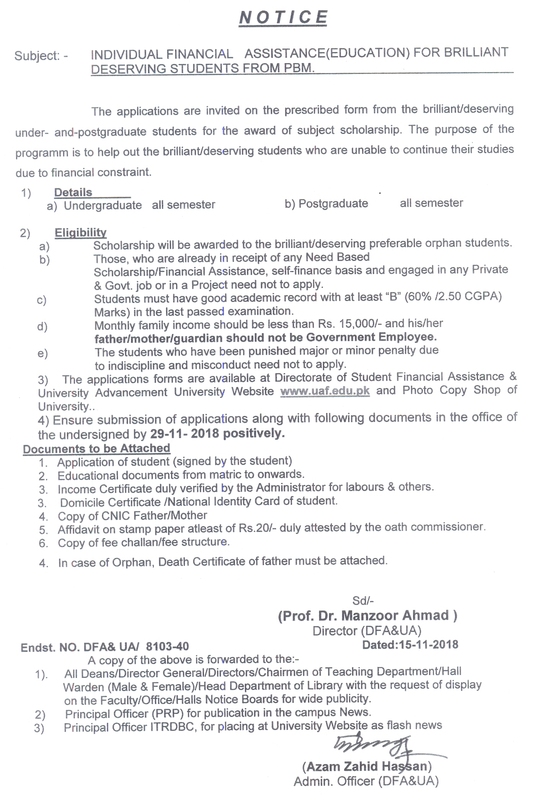 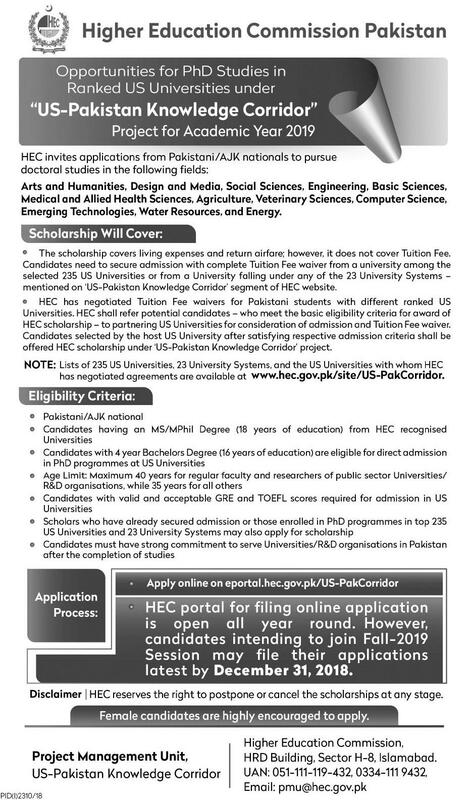 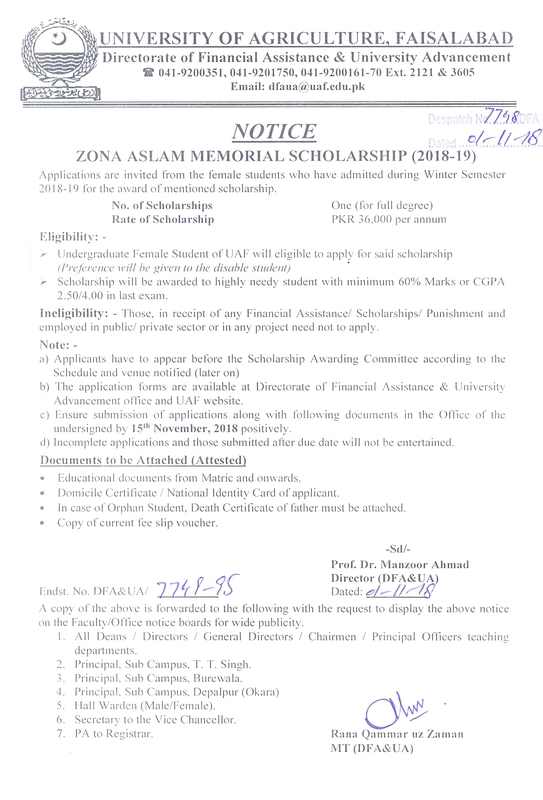 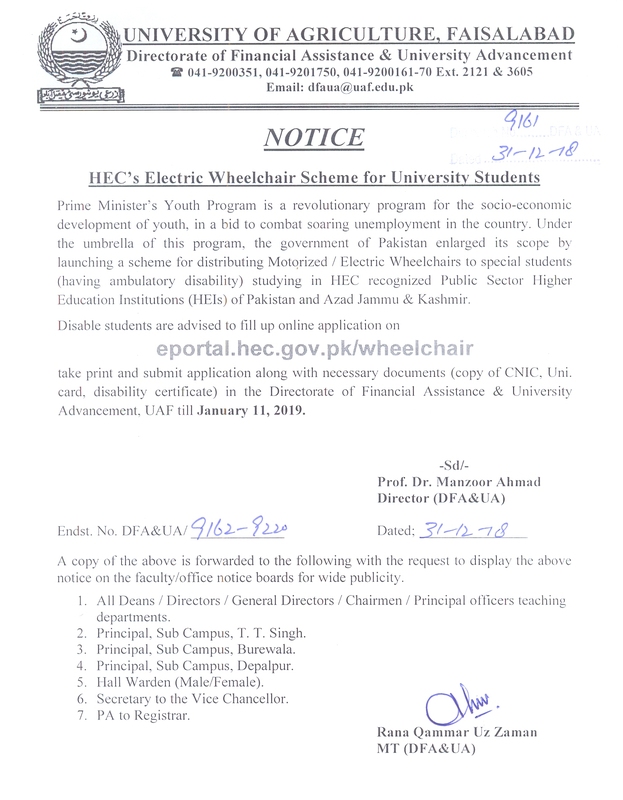 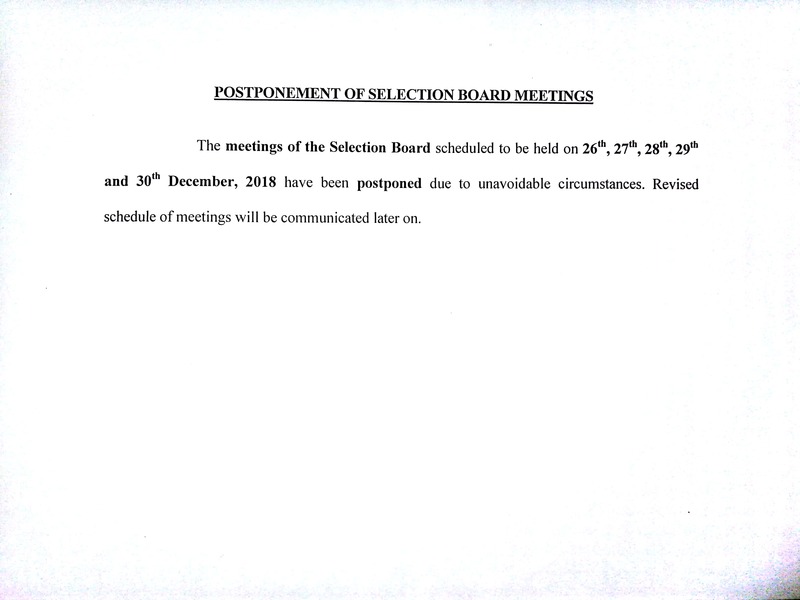 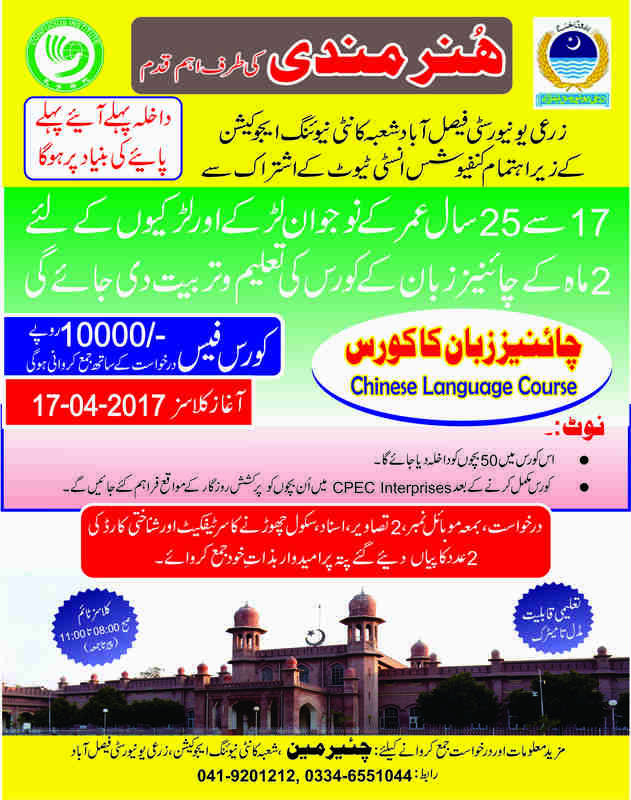 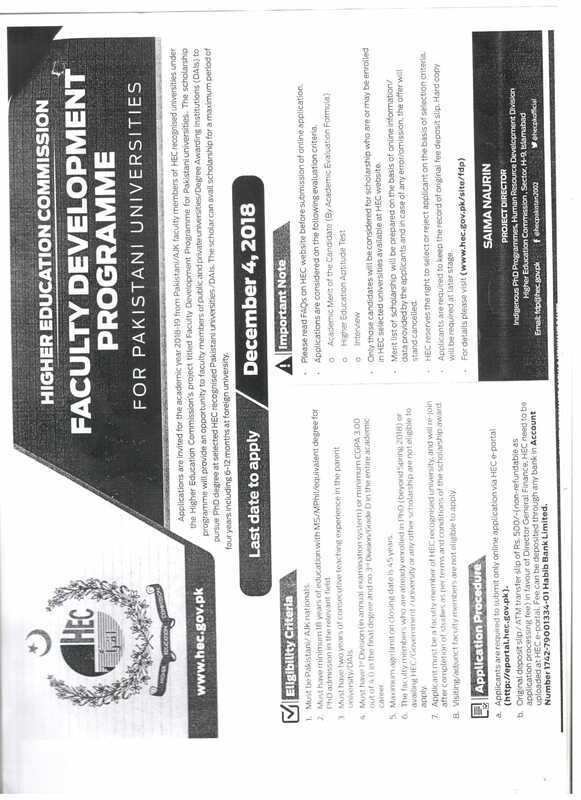 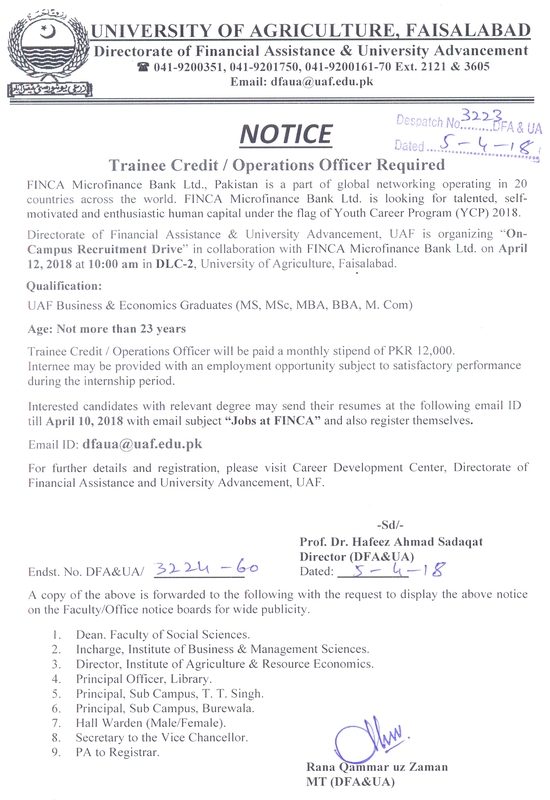 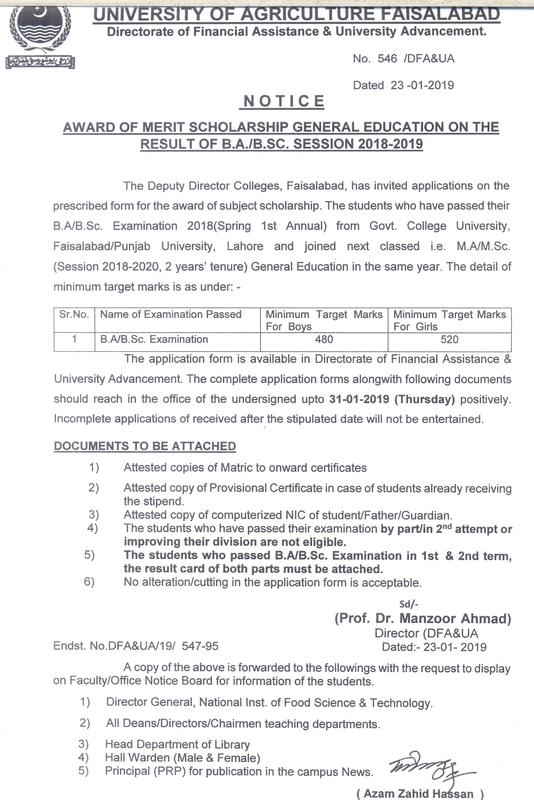 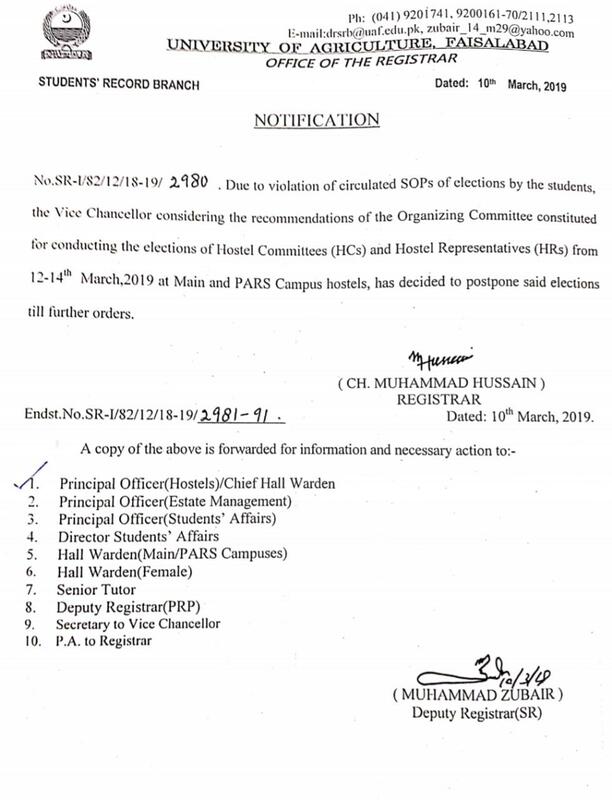 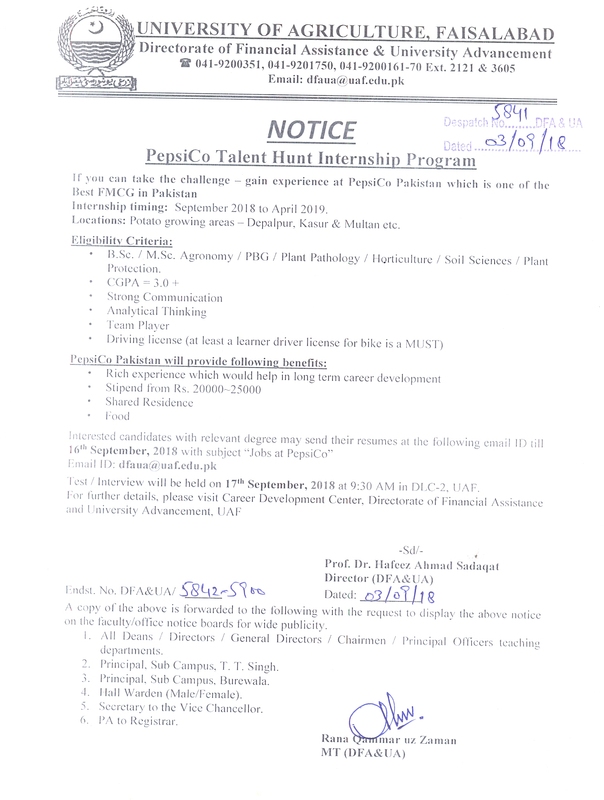 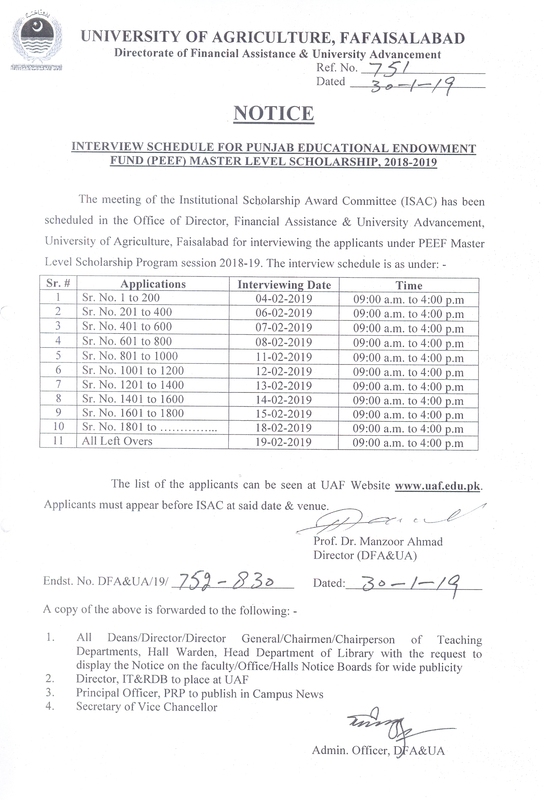 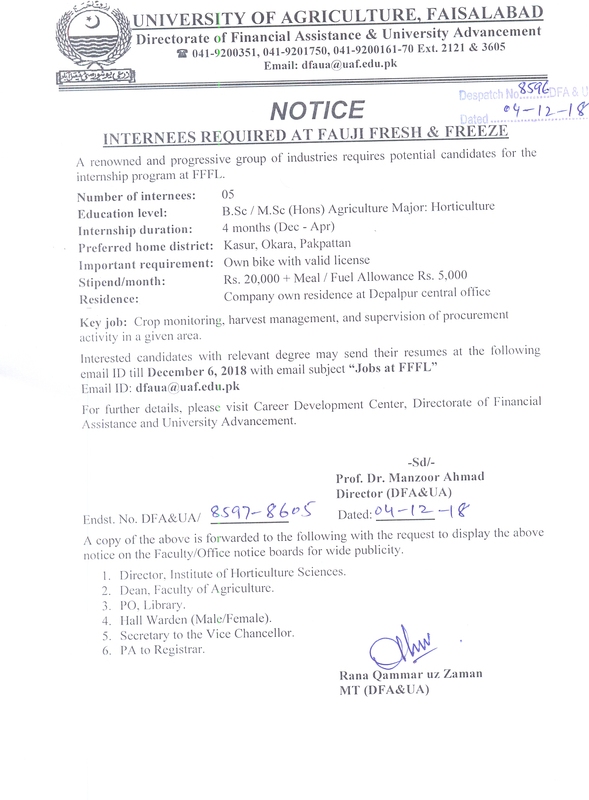 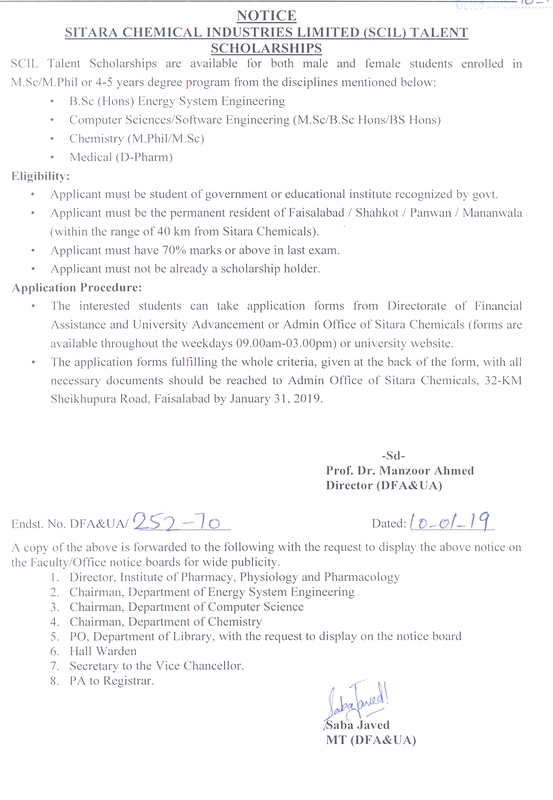 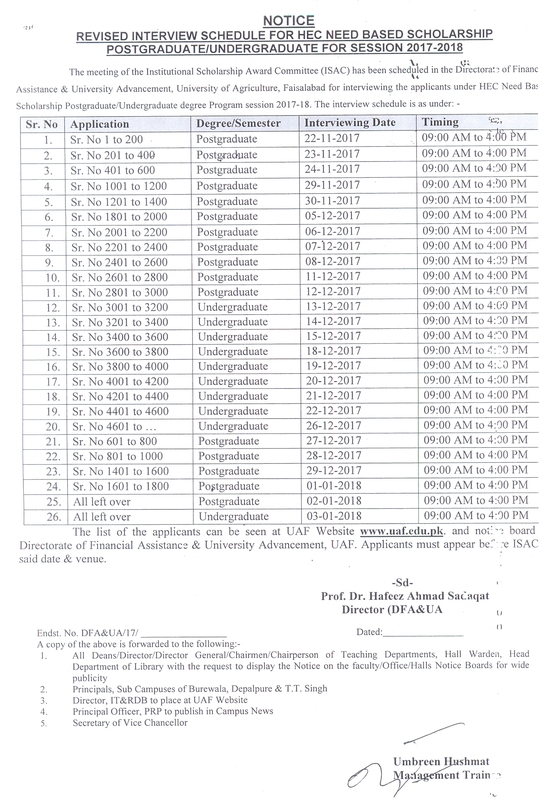 Offering a new elective course no DHL-401 "Career Development Skills"
Notice of Punjab Educational Endowment Fund (PEEF) Master Level, 2016-17 (1st, 2nd, 3rd) Installment (2nd List of PEEF Candidates). 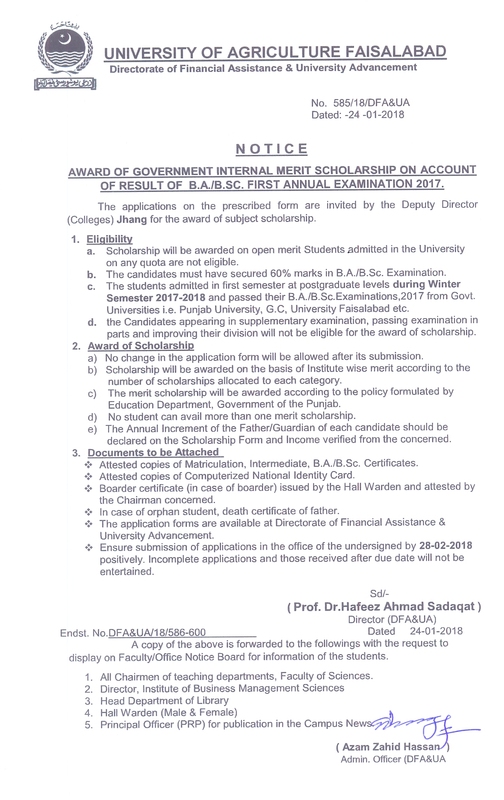 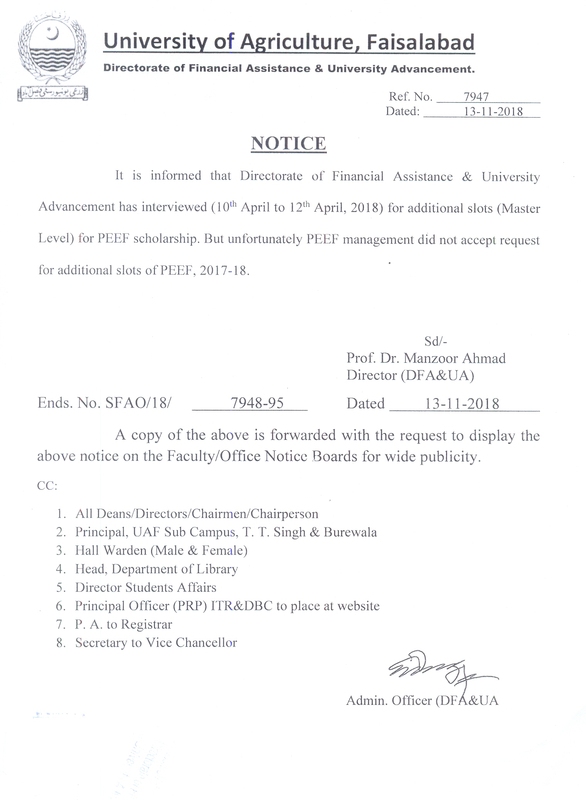 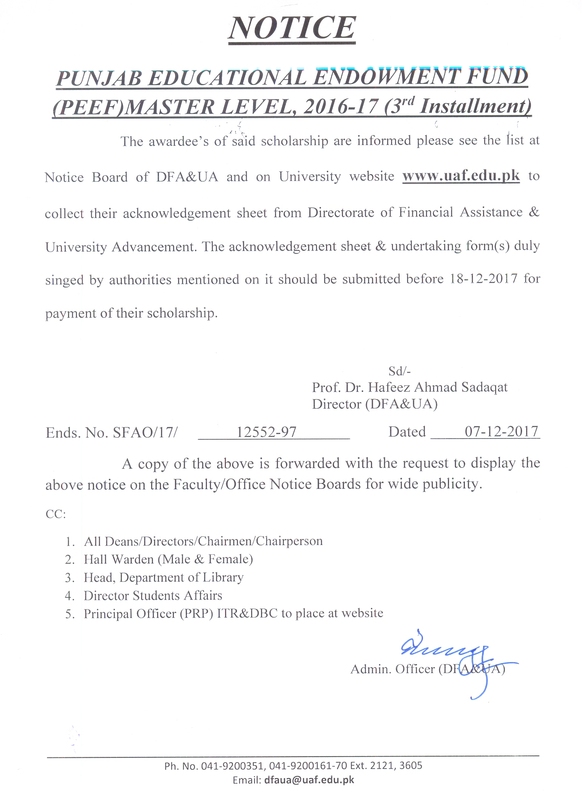 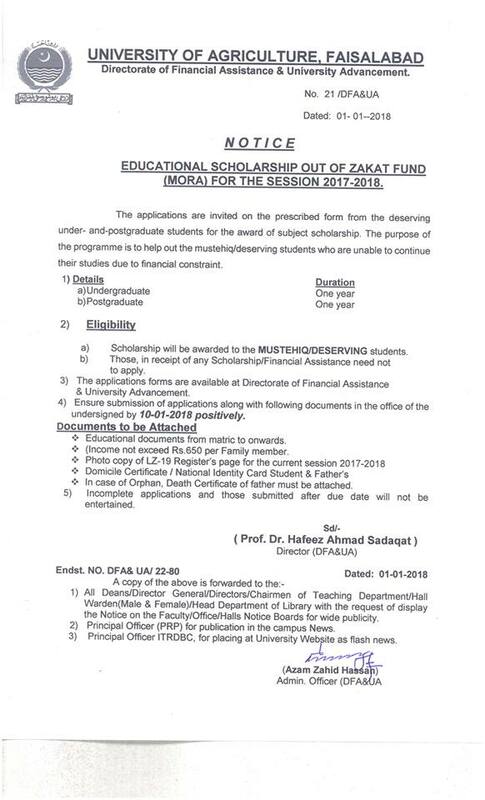 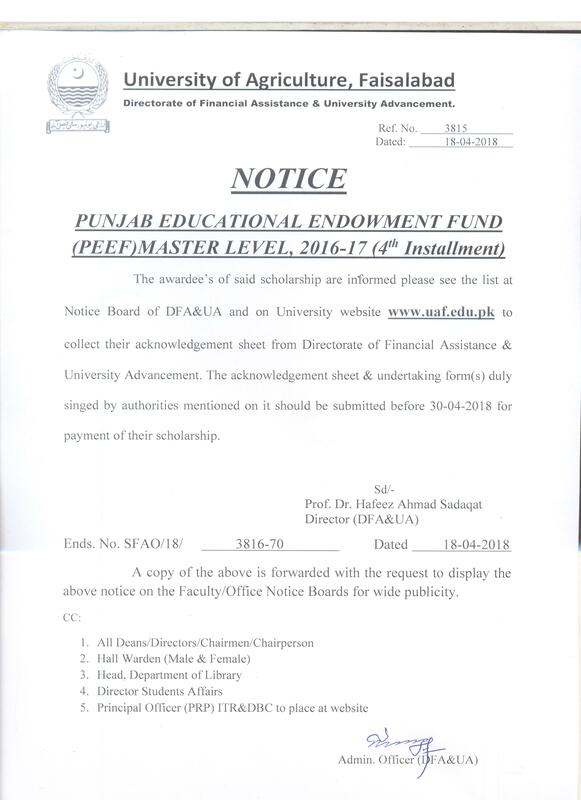 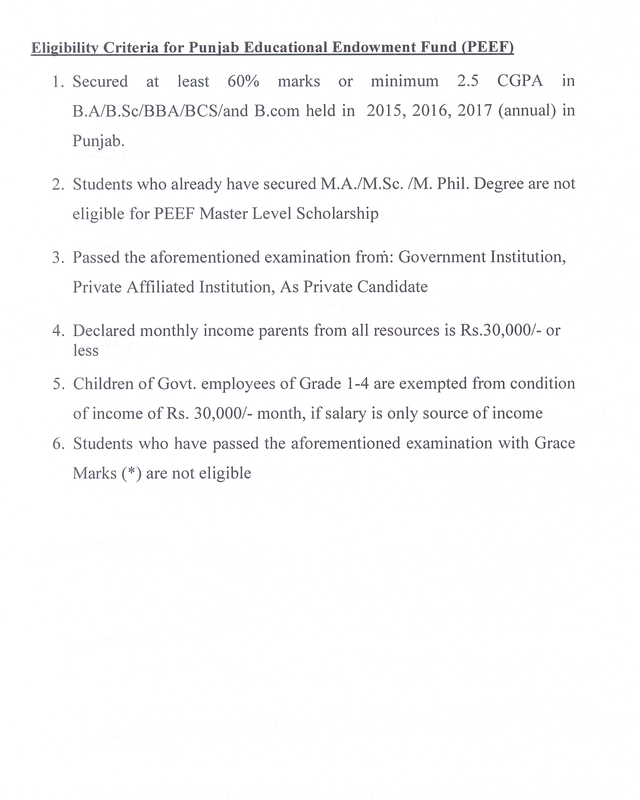 List of Punjab Educational Endowment Fund (PEEF) Master Level, 2016-17 (1st, 2nd, 3rd) Installment (2nd List of PEEF Candidates). 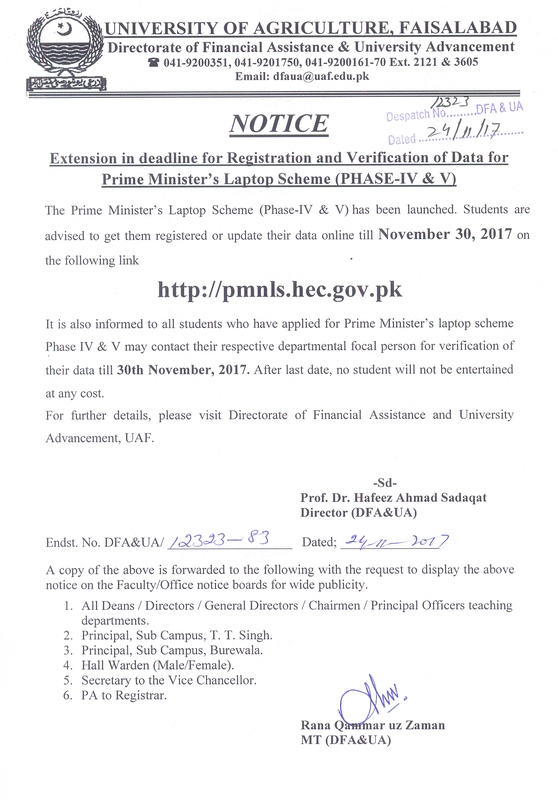 Departmental Focal Persons of PM laptop Phase-4 for verification of data. 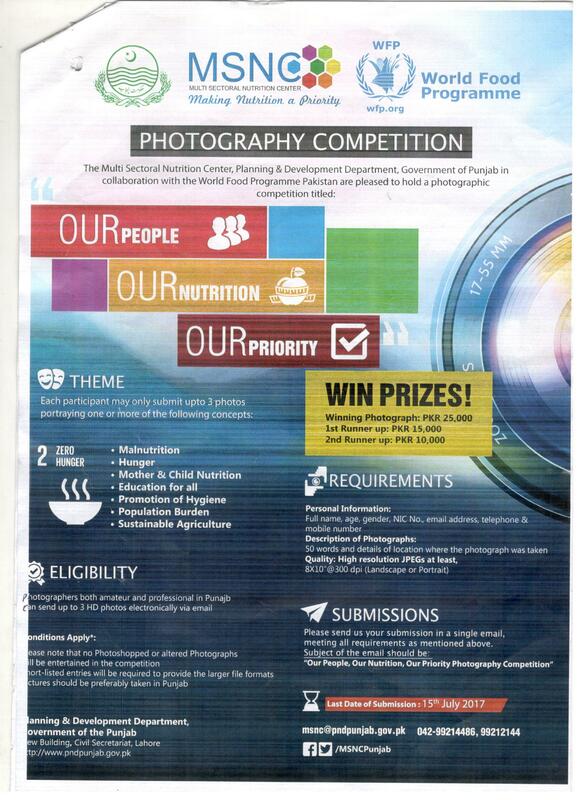 The Multi Sectoral Nutrition Center, Planning & Development Department, Government of Punjab in collaboration with the World Food Program Pakistan is pleased to hold the first photography competition titled “OUR PEOPLE, OUR NUTRITION, OUR PRIORITY”. 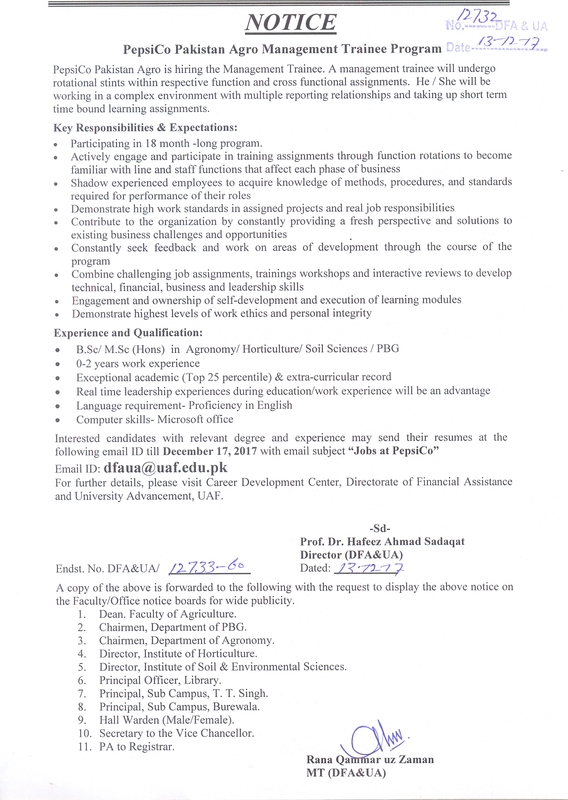 Amal Career Prep fellowship- developed out of Stanford University and in partnership with PEEF (Punjab Education Endowment Fund). 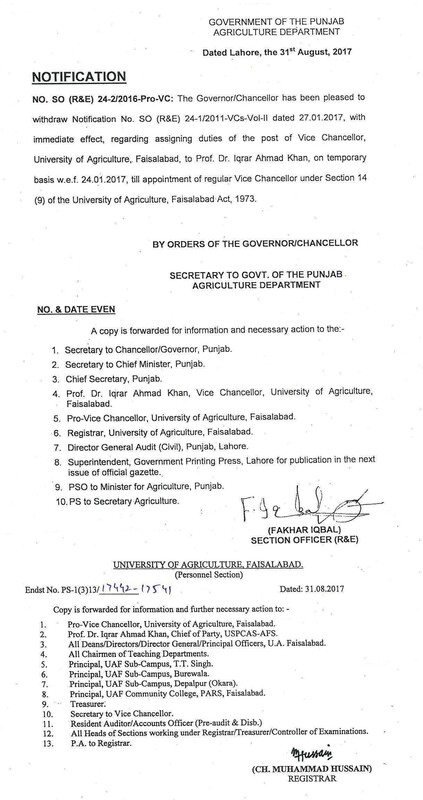 Registration form for "International Conference on Forestry and Environment: Prospects and Challenges (ICFE)"
The "OLD CAMPUS BUILDING" at main campus of the University of Agriculture, Faisalabad is renamed as "PUNJAB AGRICULTURAL COLLEGE (PAC) LYALLPUR BLOCK"
2nd LIST OF BOOKS DONATED BY PROF. DR. IQRAR AHMAD KHAN, VICE CHANCELLOR, UNIVERSITY OF AGRICULTURE, FAISALABAD. 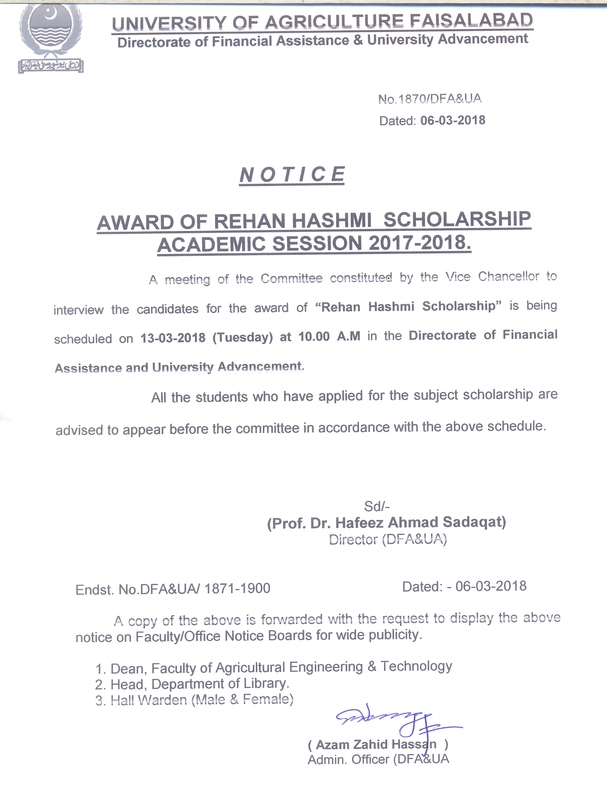 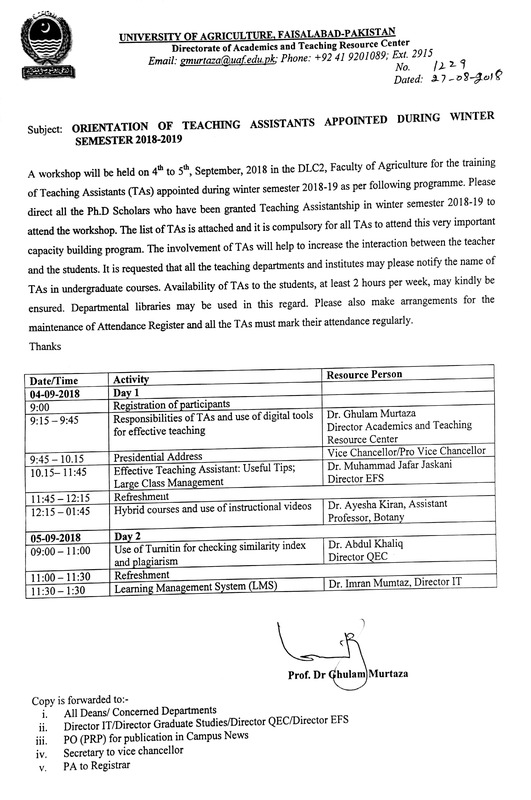 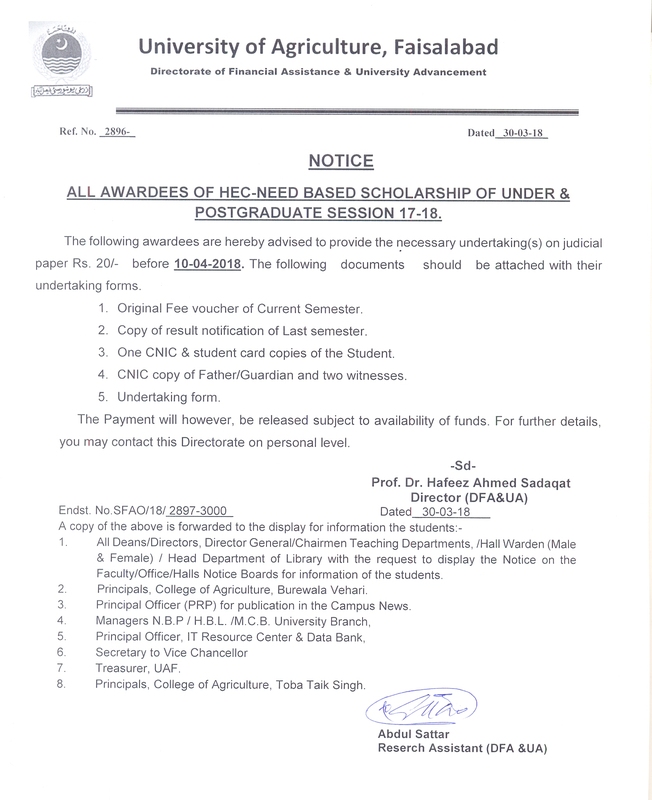 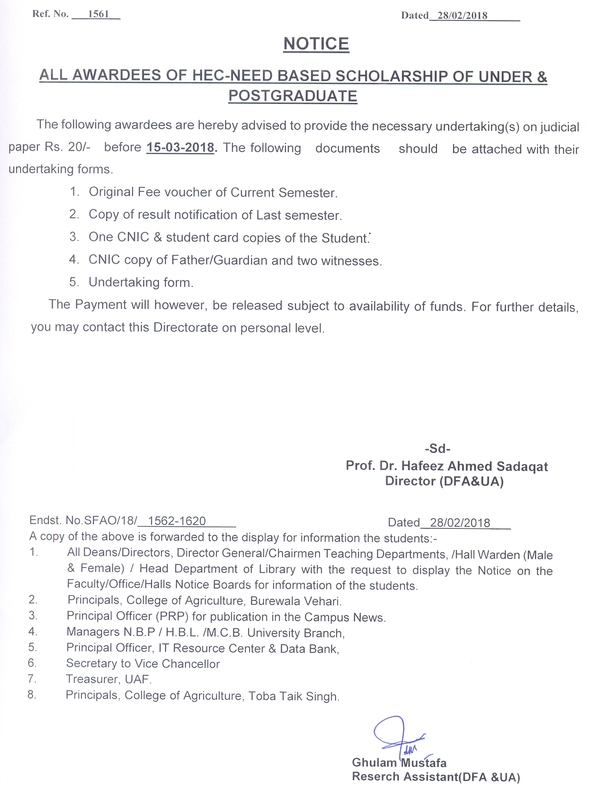 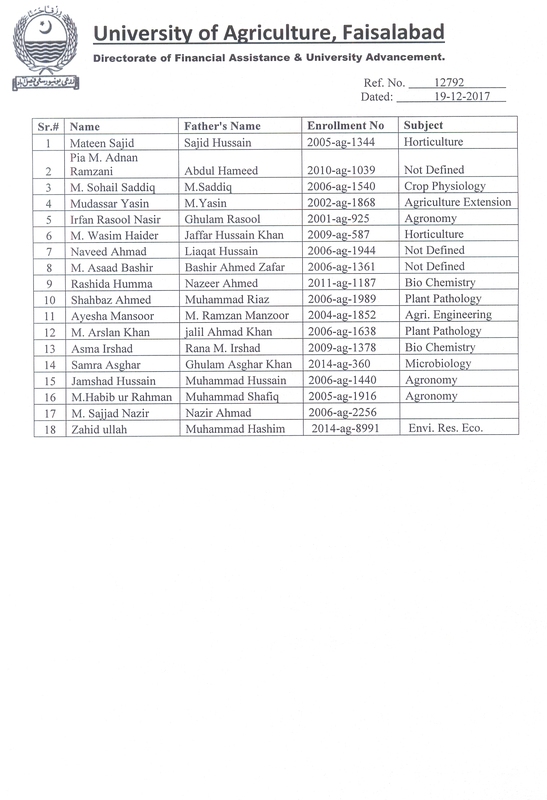 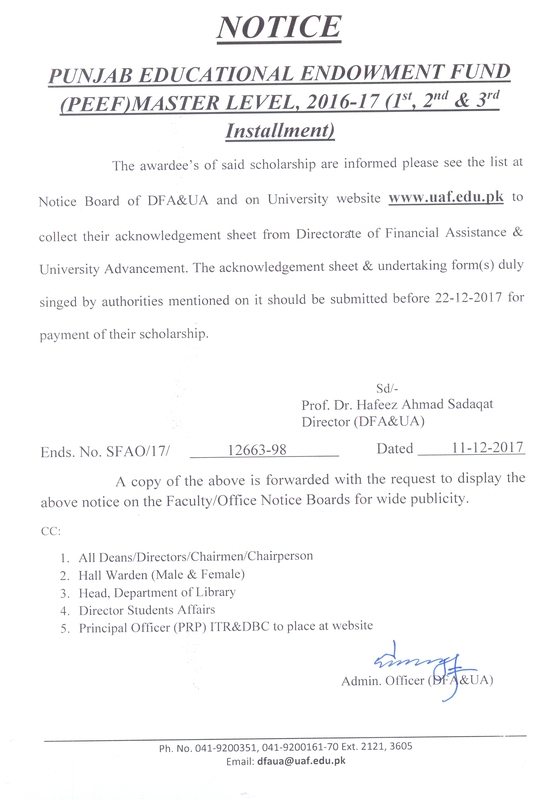 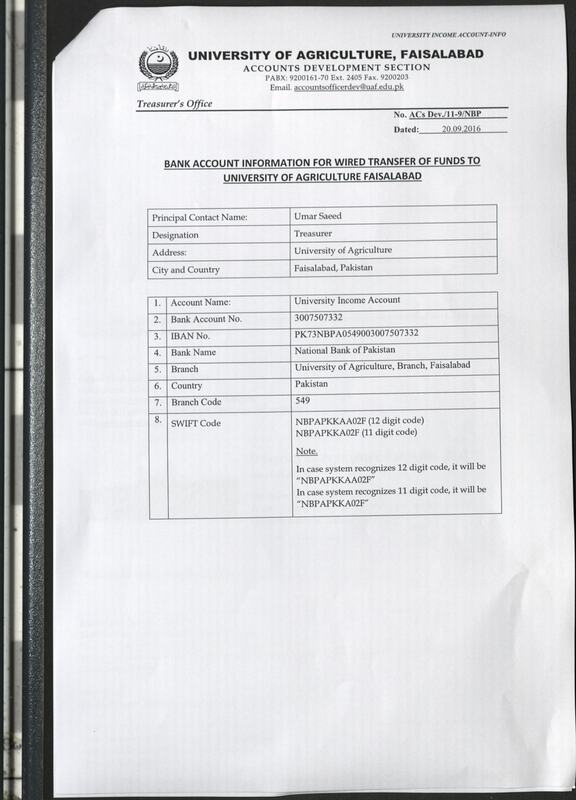 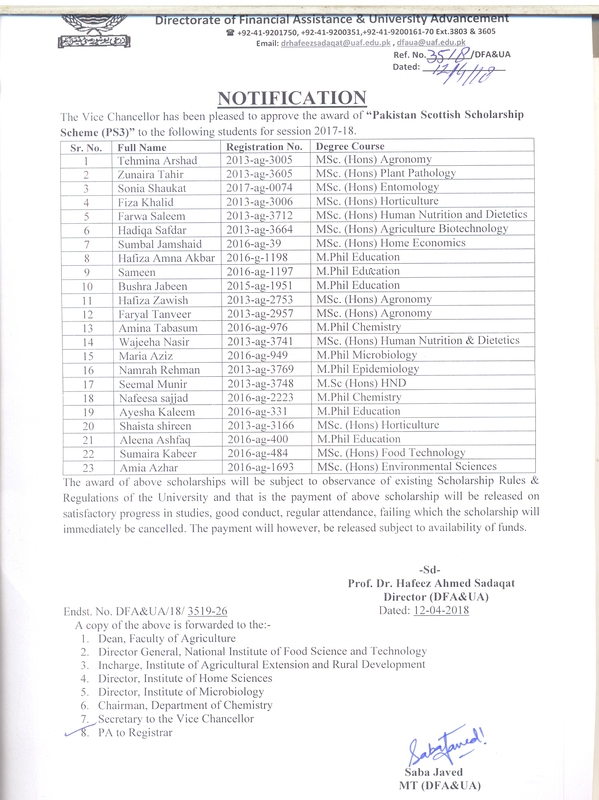 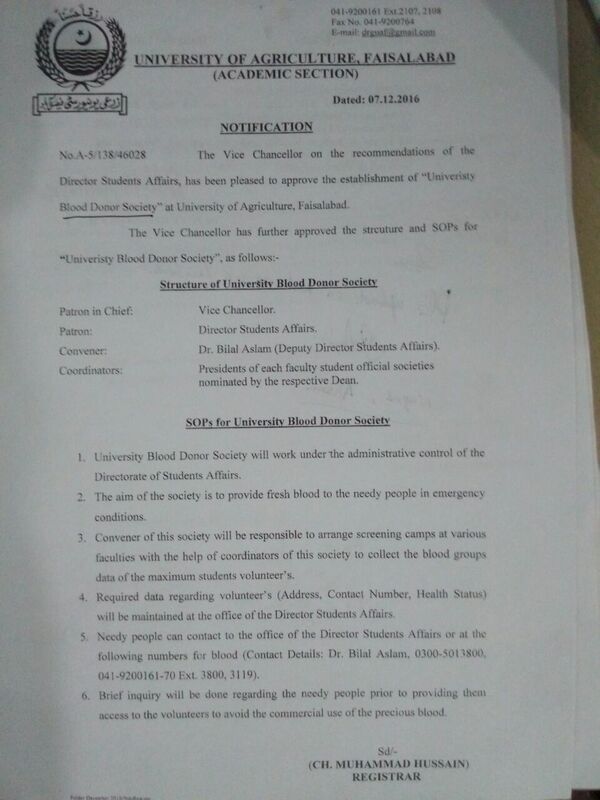 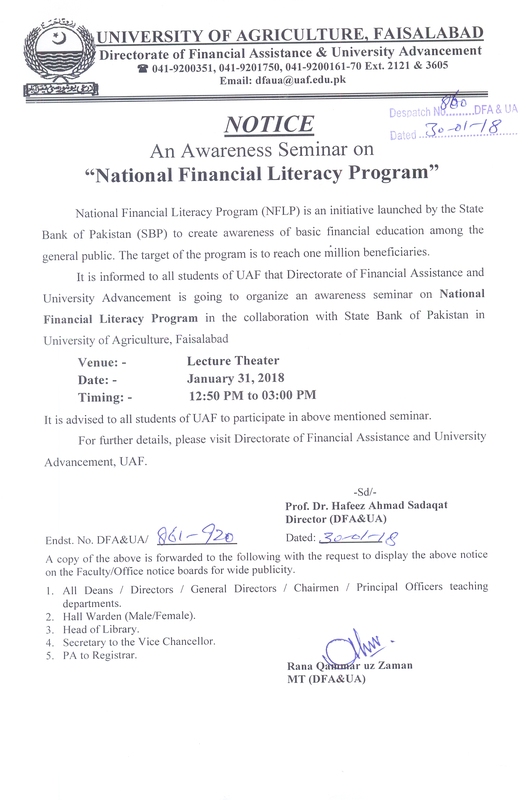 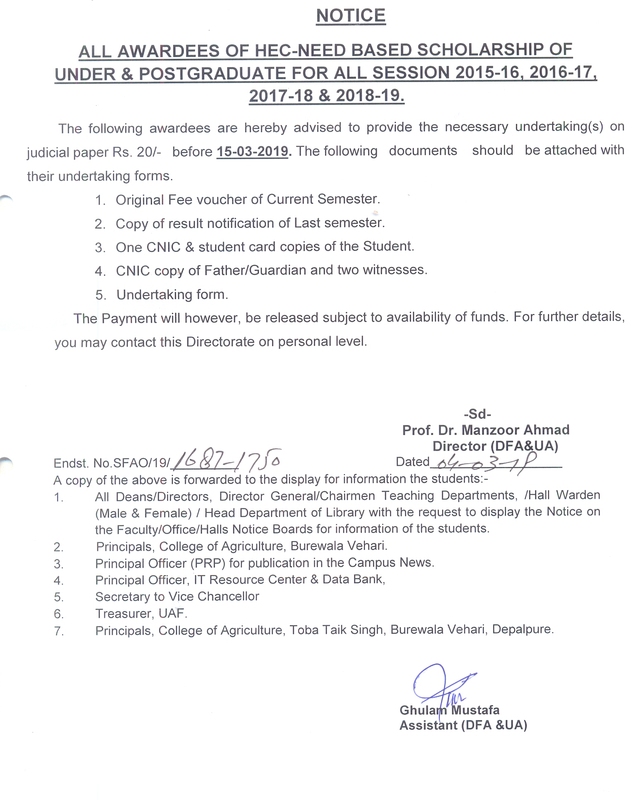 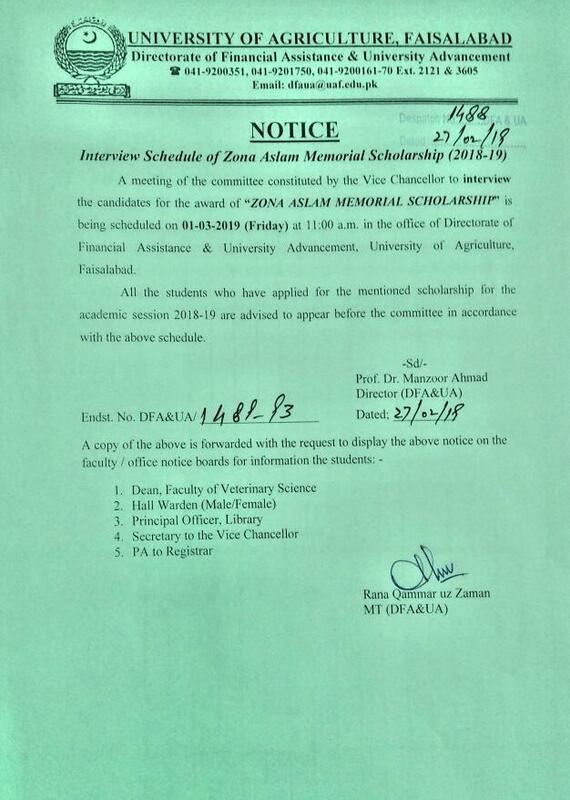 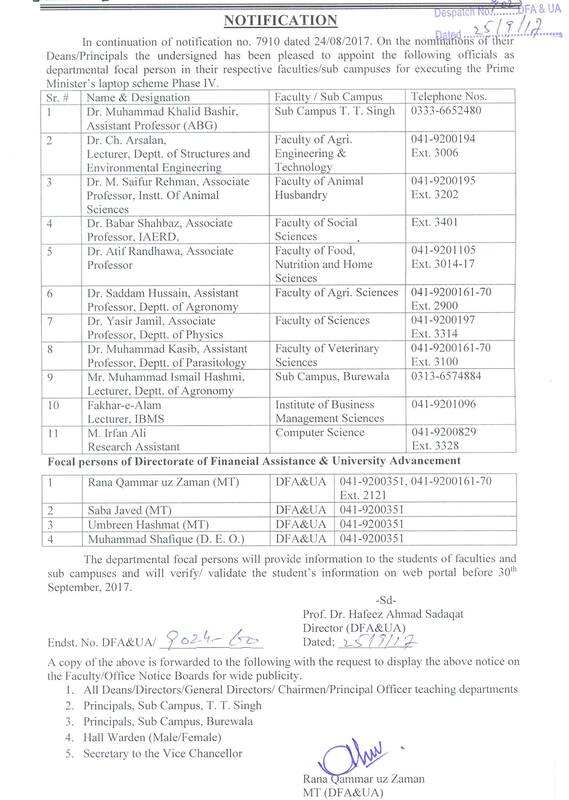 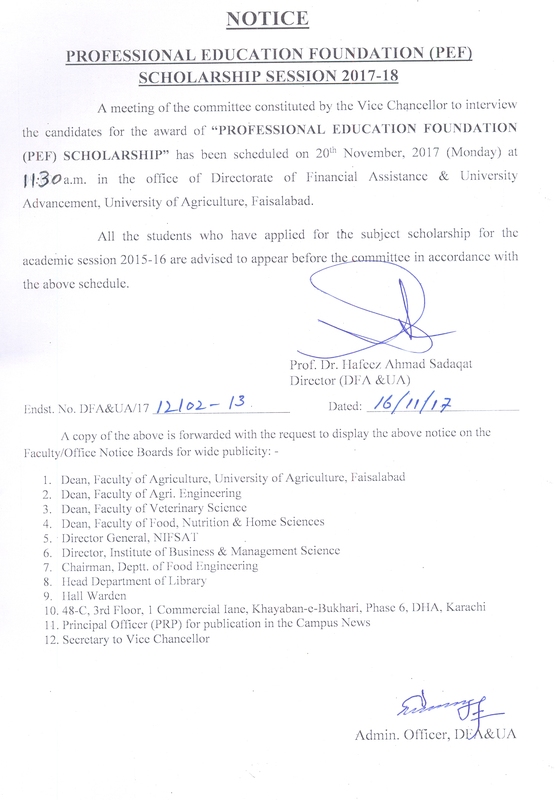 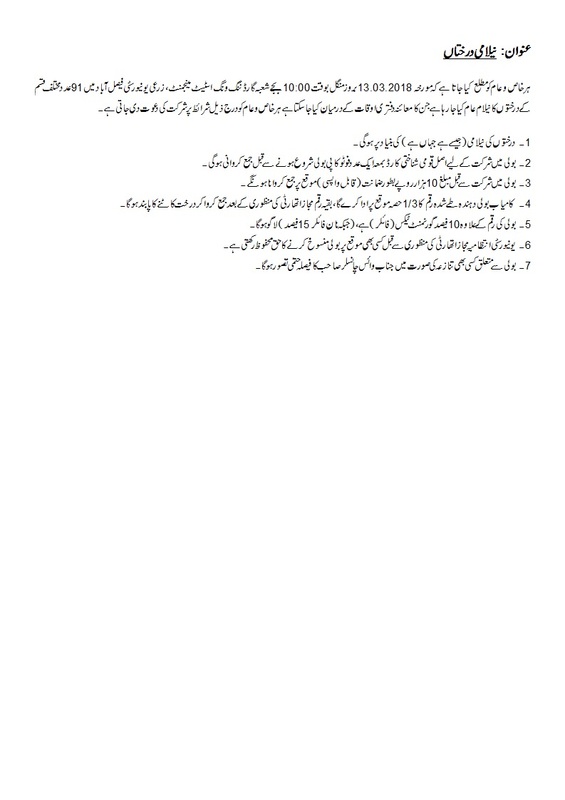 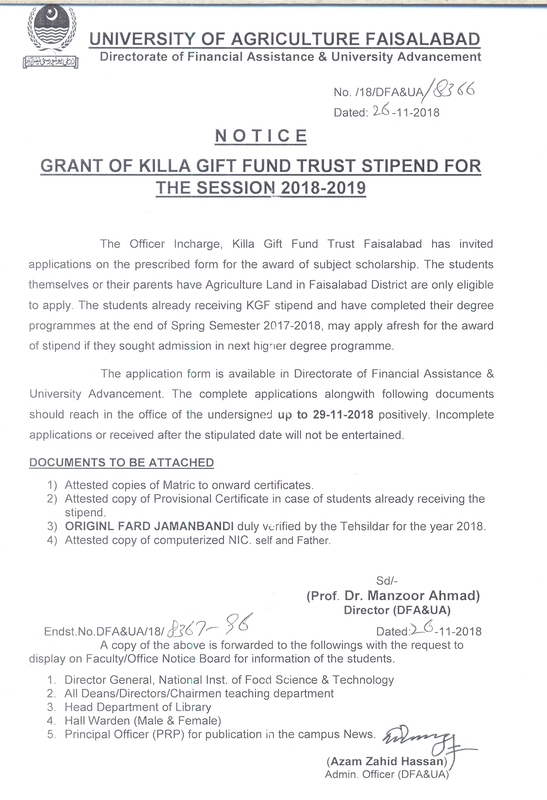 LIST OF BOOKS DONATED BY PROF. DR. IQRAR AHMAD KHAN, VICE CHANCELLOR, UNIVERSITY OF AGRICULTURE, FAISALABAD. 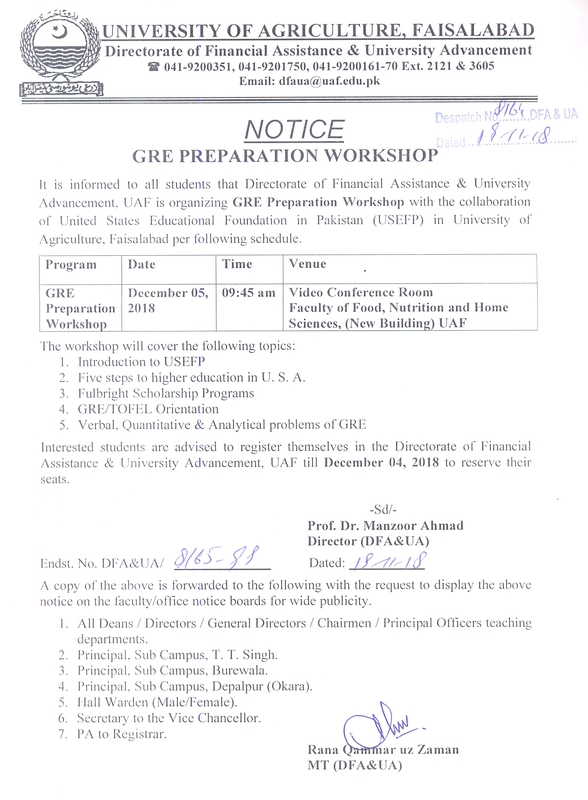 Press Release:Training workshop on Applications of Bioinformatics in Genomics, UAF. 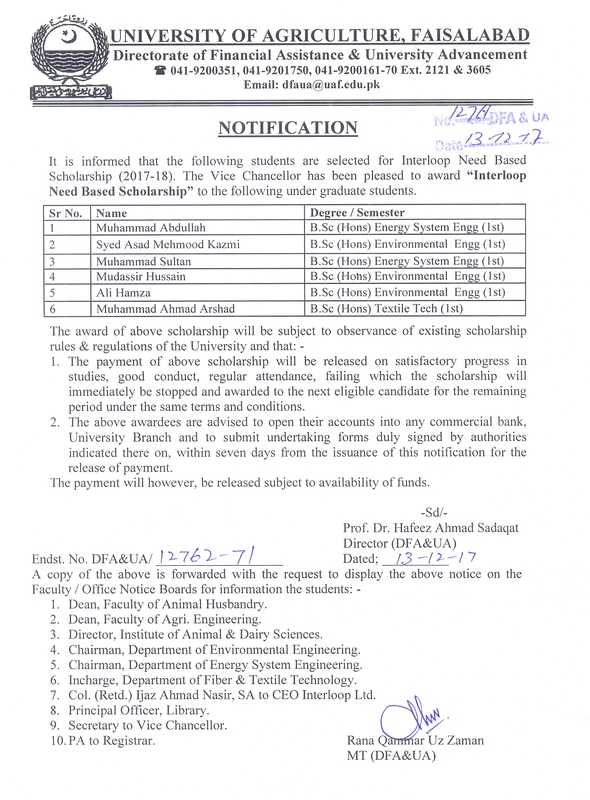 Causes, Diagnosis and Treatment of Blood in Milk (Hemolactia) in Cows and Buffaloes.